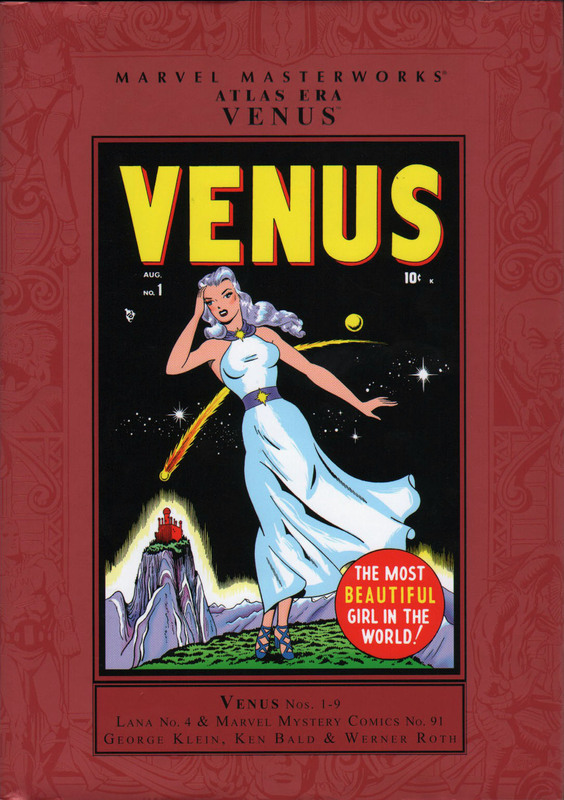 VENUS Vol 1 collects the first 9 issues of this well known 19 issue Timely/Atlas title, a title with feet planted firmly in both the Timely and the Atlas periods of Marvel's history. Although it's been two and a half years since the release of this collection, I've long had a discussion of it on the back-burner. 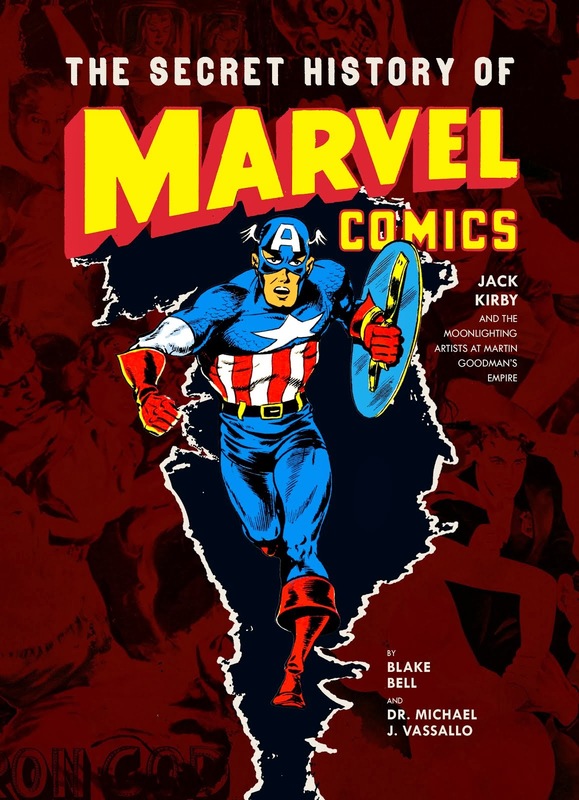 I was intimately involved with the production of this, one of my favorite Marvel Masterworks volumes, having spent a lot of time working on the credits as well as writing the introduction and loaning Marvel all 19 issues for color correction and any scanning that may have been necessary. Much of what I wrote about will be cobbled together below interspersed with newer commentary and visual samples. I'm not giving out too much visually of the stories because I want you to buy the book. If you buy the book, we'll get Volume 2 that much sooner. So buy it here at a discount, I want to see it sell out. The Timely portion of this title pertains to the fact that the earliest issues were produced by the Timely bullpen in a manner that all the books were produced throughout the decade of the 1940's. The Atlas portion of this title concerns the fact that the Timely bullpen was at that point in time disbanded and the issues were produced by freelancers, in particular "one" freelancer, who will put his stamp on the last seven fantastic sci-fi and horror issues. 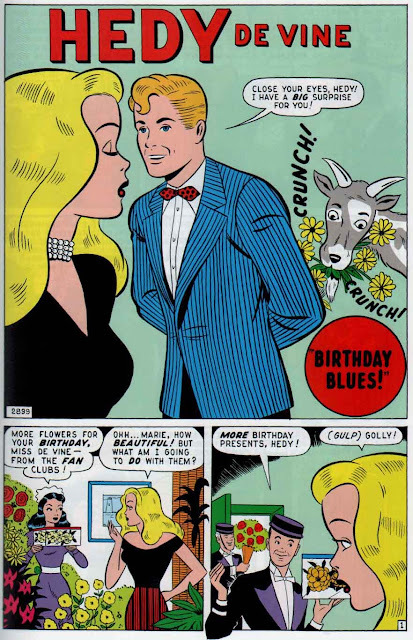 That freelancer was the incomparable Bill Everett. These issues will appear in the future Volume 2, and not a concern for us at the moment. 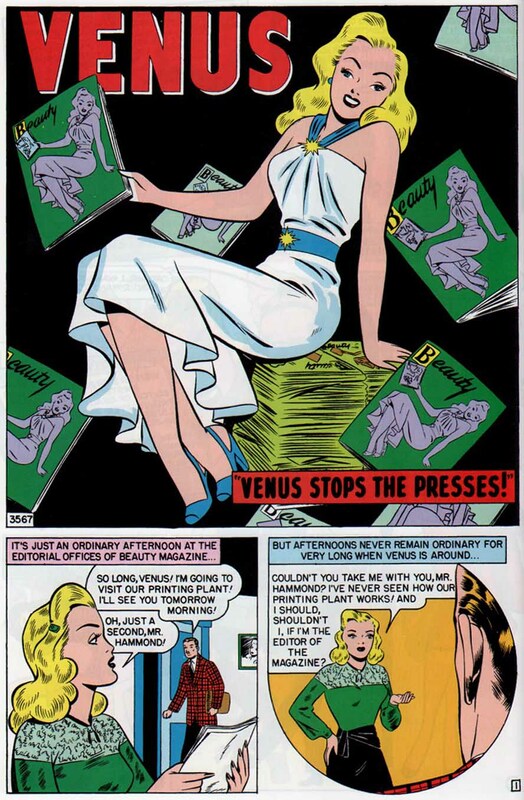 Venus was a unique chameleon-like title, able to survive the ravages of Martin Goodman's cancellation whim by virtue of somehow being able to change genre to suit the market’s fancy. 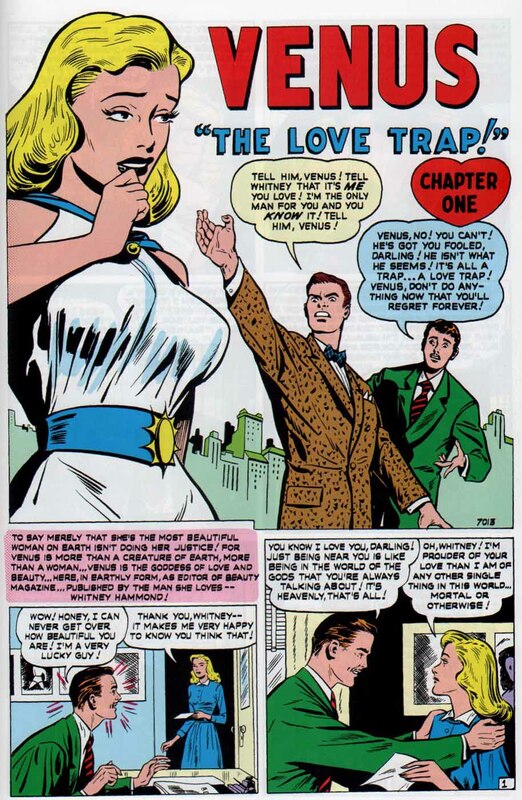 As Stan Lee was editor-in-chief of Goodman's comic book line, I can only wonder if Stan had a particular affinity for the blonde "Goddess of Love", and when he sensed sales were stalling, rather than wait for his boss to issue a termination order, instead purposely pushed the writers' plots towards whatever flavor-genre of the month was selling better. Let’s set the stage of this title with a little history. 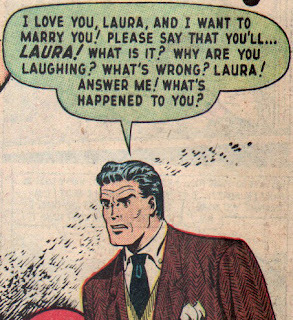 In the post-war period superhero title sales were dropping as these heroes' exploits started to lose their luster with the reading public. One by one they began to get the axe as humor, crime, westerns, romance and horror titles pushed them out. By 1948, with the handwriting on the wall, Timely tried one last time to rejuvenate what was obviously a failing super-hero genre. In the midst of all kinds of debut books in all the new genres (and alongside these rapidly failing, long-running familiar hero publications), Timely incomprehensibly released "six" new hero-"esque" type titles. The first was Blackstone (May/48). Martin Goodman had taken over the license from E.C. Comics, starting the title with #2. 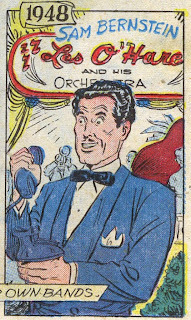 The famed magician Blackstone in comic books hailed back to Street & Smith in 1941, where he debuted in Super Magic and continued in a name change to Super Magician Comics through the 1940’s. 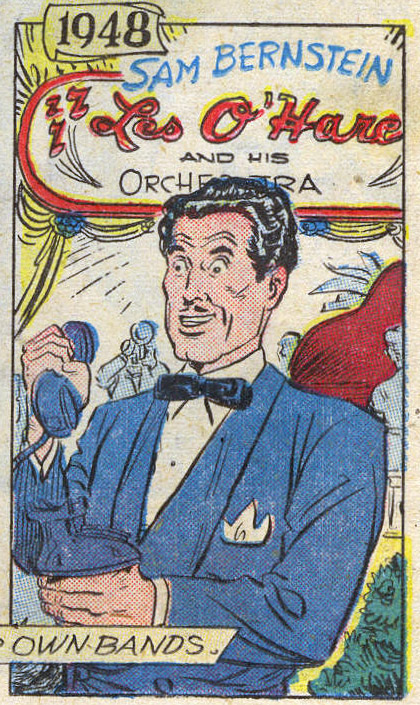 Along the way he headlined his own Blackstone, Master Magician Comics in 1946 now published by Vital (Street & Smith replaced the loss of Blackstone with the fictional magician Nigel Elliman), before E.C. 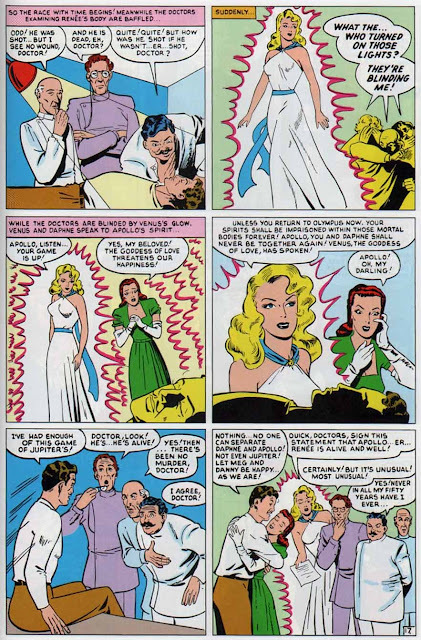 Comics gained the license in 1947 for their one-shot Blackstone, The Master Magician Fights Crime. Timely’s numbering continued E.C’s numbering and the author of Timely’s Blackstone stories was Walter Gibson, who helmed the title back in the Street & Smith days. 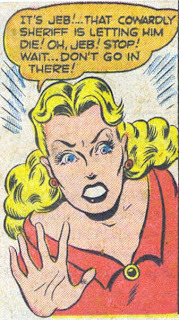 After three lackluster issues each sporting Blonde Phantom back-up stories, the book was cancelled. Next came a triumvirate of issues all cover dated Aug/48. 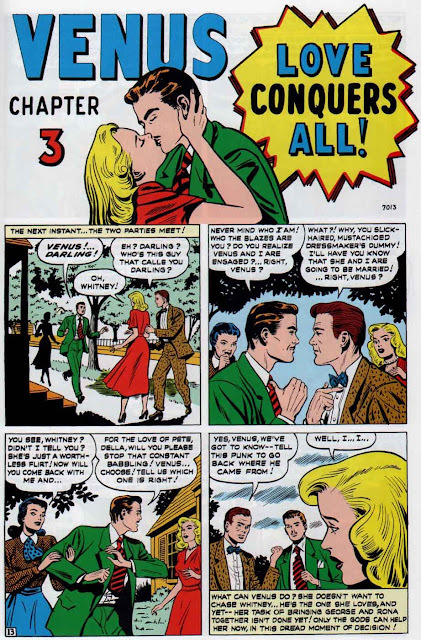 All Winners was re-launched, attempting to cash in on the final issues of the earlier title’s momentum in issues #19 and #21. It didn’t work and the book was cancelled after a single issue and changed to a western, All Western Winners, which became Western Winners, Black Rider and ultimately Gunsmoke Western. 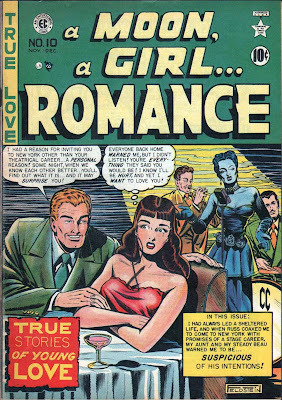 Completely aware of the post-war surge in female readers who were eating up the teen and romance comics, Timely tried Sun Girl and Venus. 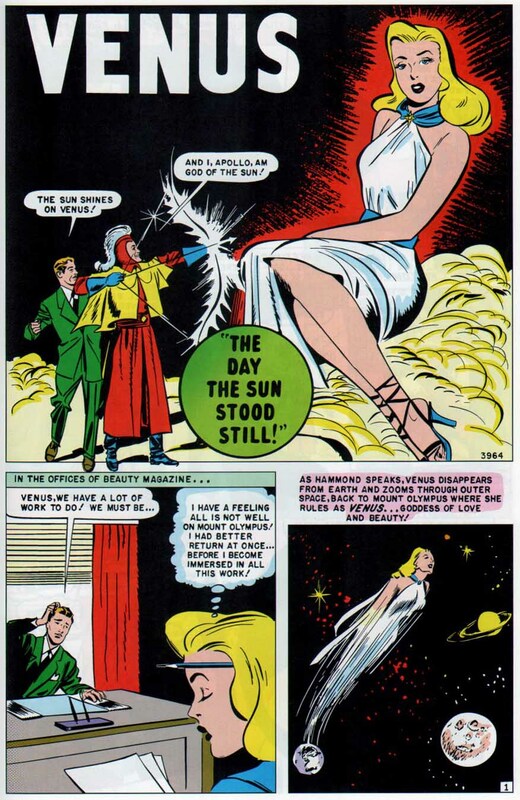 Sun Girl would last 3 issues before cancellation. 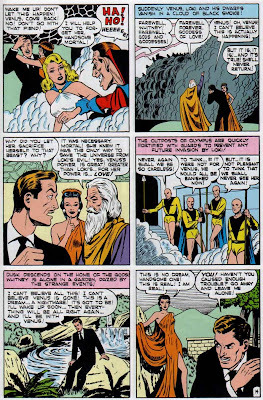 Fall/48 would see Namora appear, also lasting only 3 issues. Finally Sept/48 gave us The Witness #1, a Shadow-like take on a similar named hero character from Mystic Comics earlier in the decade. 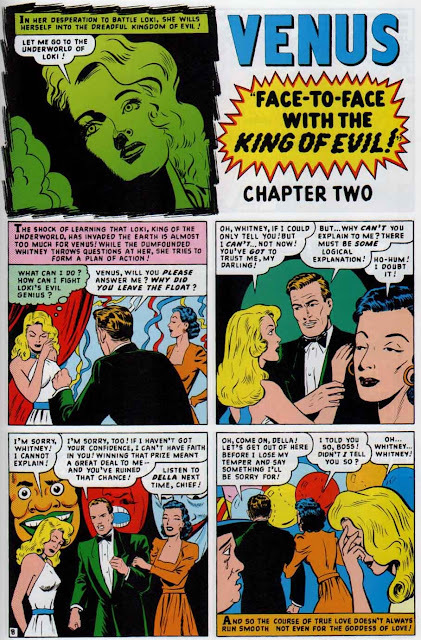 The Witness would last a single issue with straggler stories for a never released second issue appearing as back-ups in issues of Captain America, Marvel Mystery Comics, Ideal and Amazing Mysteries in 1949. 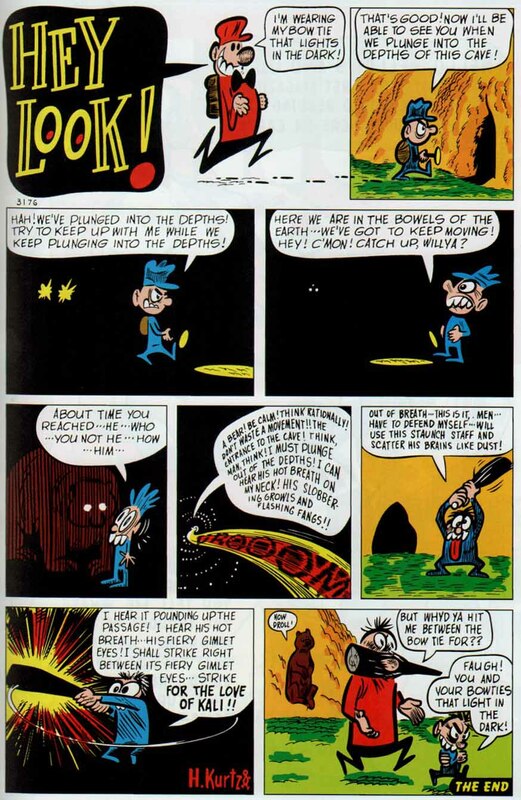 Timely was in an incredible state of flux in early 1948. 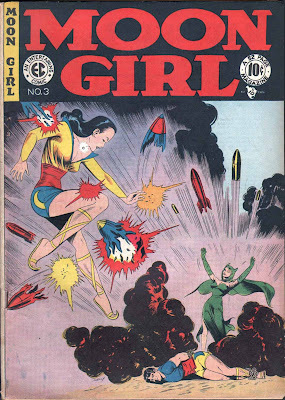 The newsstands began to fill with comic book genres never seen before which were overtaking super hero sales. To give a Timely example of this flux, random cover dates July, August and September 1948 also saw the debuts of such diverse titles as Ideal a Classical Comic #1, Complete Mystery #1, Krazy Komics #1 (2nd series), Wacky Duck #1 (2nd series), Lana #1, Kid Colt #1, Tex Morgan #1, Tex Taylor #1, Blaze Carson #1, and Timely’s debut romance title, My Romance #1. What about Venus? 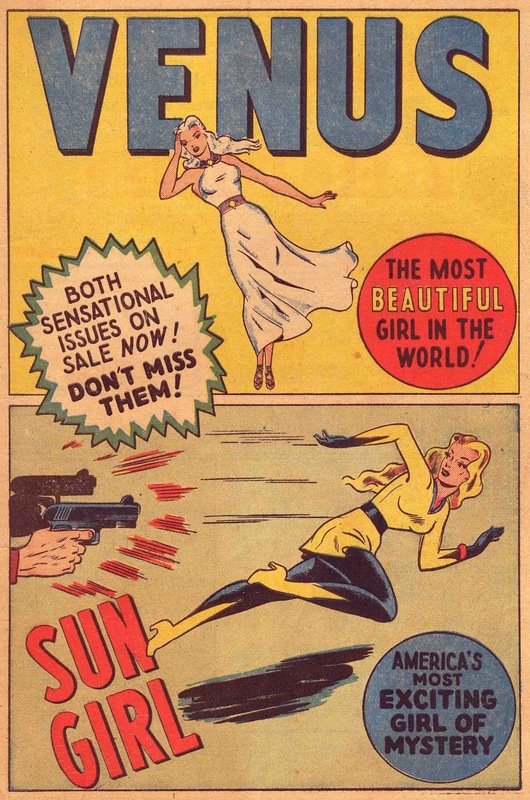 Launched alongside Sun Girl and Namora, in spite of her mythological trappings, Venus, from the onset, had more in common with the successfully running numerous teen girl titles than standard hero fare. The quick demise of the aforementioned 5 short-run hero revival titles, coupled with the cancellation of the Human Torch, Sub-Mariner, Blonde Phantom, Marvel Mystery Comics and Captain America in 1949, left Venus all alone in a unique position. 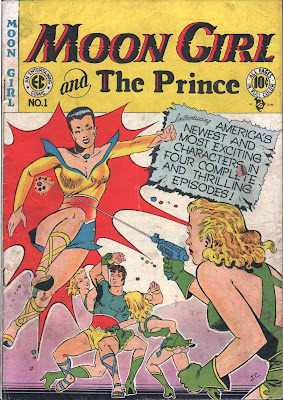 Looking at this in even more detail, for comparison’s sake, we really only should parallel Venus against Namora and Sun Girl, as all three launched as new female hero-adventure type books at the same time (Namora’s Fall/48 cover date notwithstanding, it was on the stands simultaneously with an Aug/48 date). 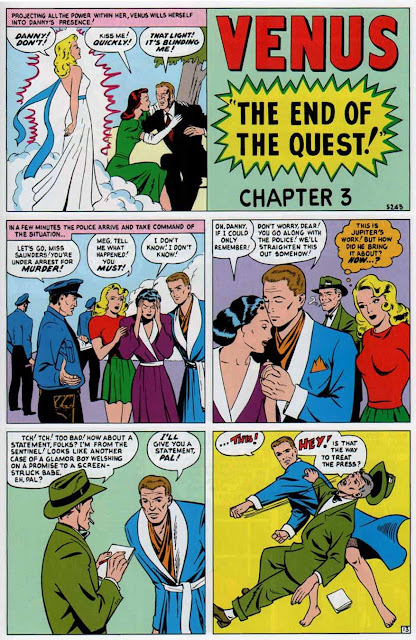 All three titles published bi-monthly and all were seemingly canceled with issue #3 (Dec/48). 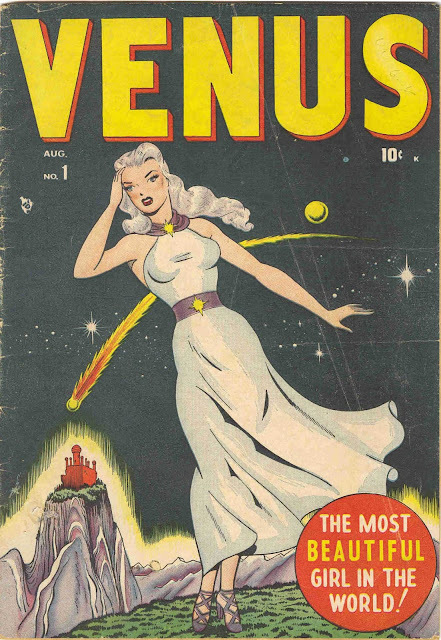 Surprisingly though, an examination of the publishing history of Venus shows that four months after the demise of all three titles, Venus received a reprieve and was revived, continuing publication with issue #4 (Apr/49), but not before two inventoried Venus stories made appearances in Lana #4 (Feb/49) and Marvel Mystery Comics #91 (Apr/49). 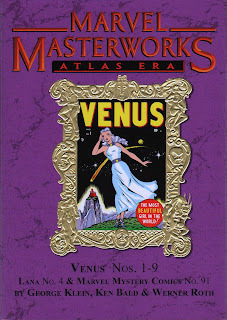 Logic would seem to dictate that the inventory was published “before” the decision to re-start the title, as on ongoing Venus book would have been the most ideal place for them. 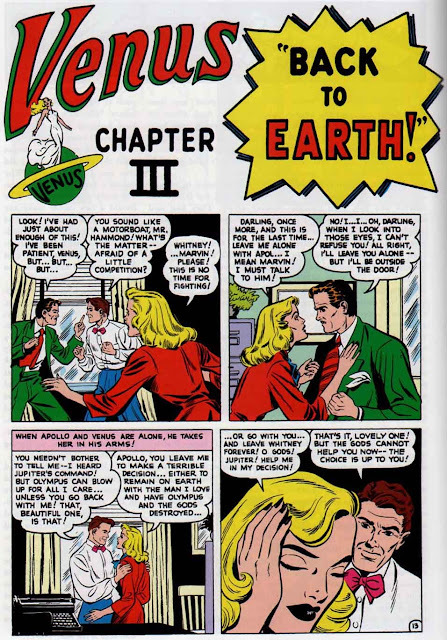 Another theory I have about this is the fact that Venus may have been planned to be a 52 page title at some point (which it eventually became with issue #9) and when it didn't, and was in fact canceled, two stories were left over and needed to be run “somewhere”. 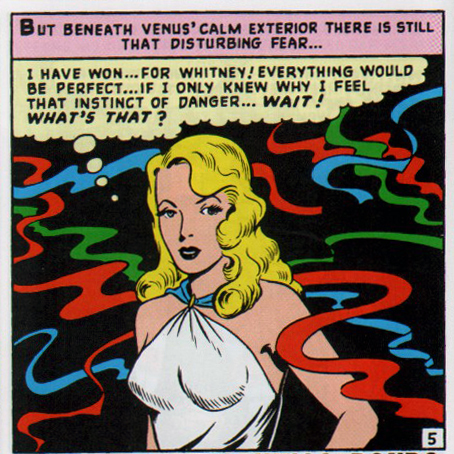 So how did Venus survive when all other titles perished? 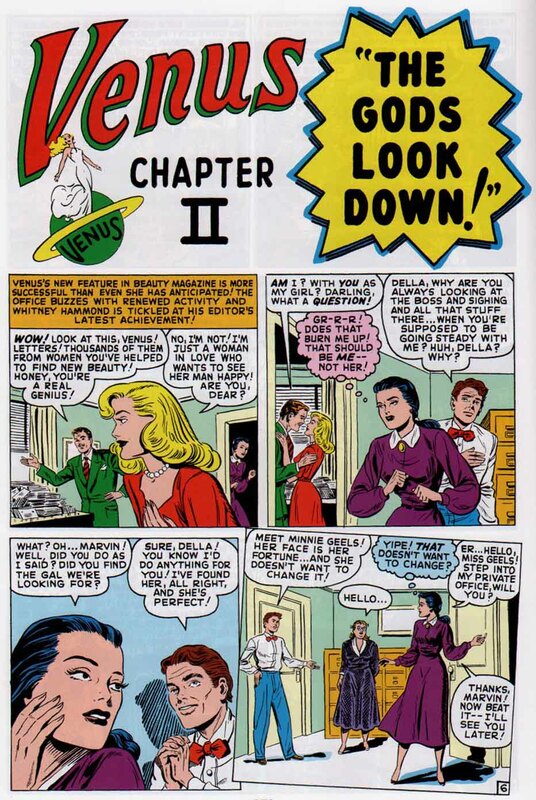 Evidence points to the fact, as I mentioned, that the Venus stories were able to subtly change plot and characterization to conform to whatever was selling best on the stands at any particular time, which at that point would have been teen humor and the nascent romance comics that were gaining traction at Timely and around the industry. 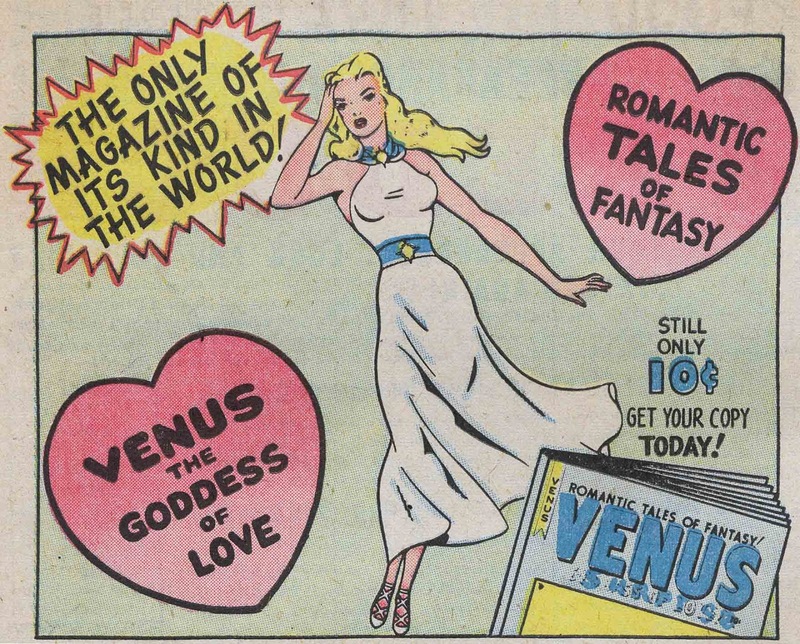 During the entire 19 issue run of her title, Venus did this several times, morphing along the way from teen humor-esque hero-adventure to romantic fantasy to mythological fantasy, and lastly from to sci-fi to horror, all while maintaining the lovely “Goddess of Love” as the main central character. Such evolution does have precedence, although in title only, not character. 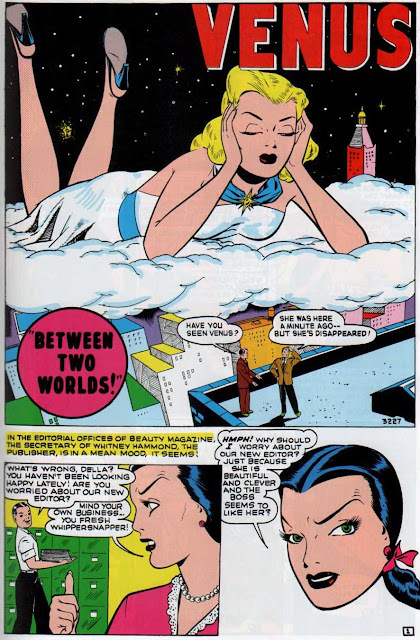 Entertaining Comics' title Moon Girl went through a similar, if not as extensive a morphological change during its run. Starting cover date Fall/47, Moon Girl and the Prince #1 changed to Moon Girl for the next 5 issues, although all 6 issues featured the same character and storylines. 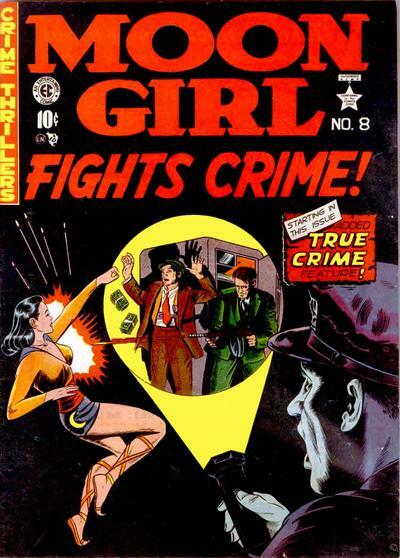 With issue #7 (May-June/49) and #8 (Summer/49) the title changed to Moon Girl Fights Crime, reflecting the crime genre wave engulfing the newsstands. #7 featured Moon Girl in all the stories against a slew of more pedestrian underworld "crime" types. 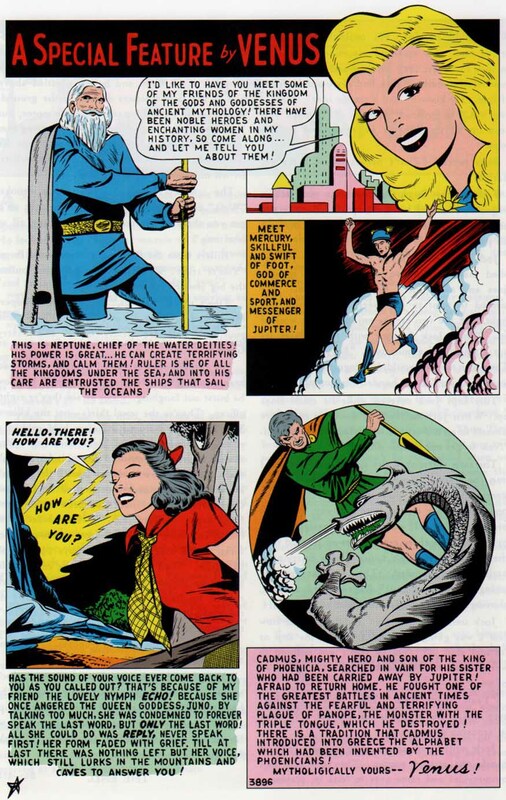 #8 featured Moon Girl in the lead story only and the rest were straight pre-code crime stories (not unlike Captain America's Weird Tales #74's Cap lead and 3 pre-code horror back-up stories). 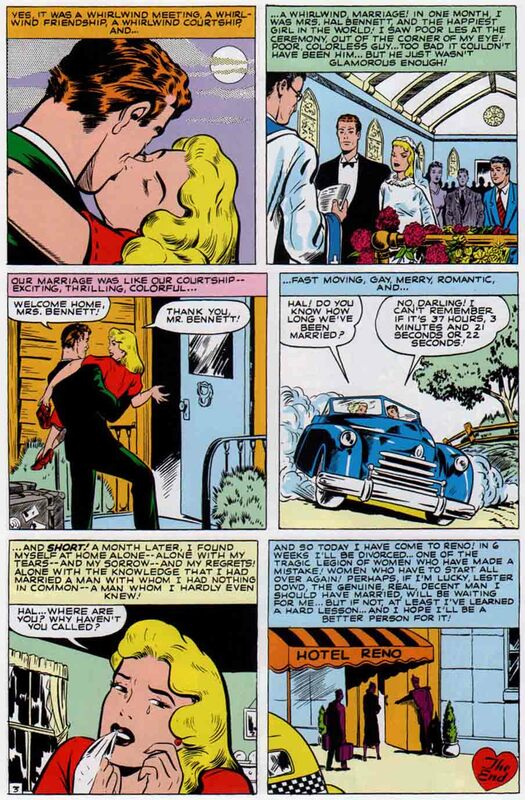 The final four issues of #9-#12 morphed even further, changing to a straight romance comic titled A Moon, A Girl ... 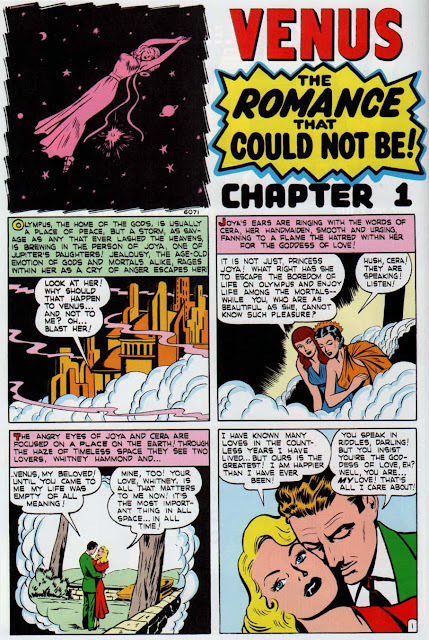 Romance, with the only vestiges of Moon Girl now left as singular, non-connected words in the title only! At least Venus was the consistent star throughout all of her 19 issues! Cartoonist/historian Trina Robbins has mentioned the likely inspiration for Venus as the 1948 film “One Touch of Venus” starring Ava Gardner. In fact, a movie still pose of Gardner as Venus is a dead ringer for a published Venus art illustration (excluding her hair color). As Robbins relates in Alter Ego #29 (Oct/03), the film was based on an earlier musical comedy with songs by Kurt Weill and Ogden Nash. 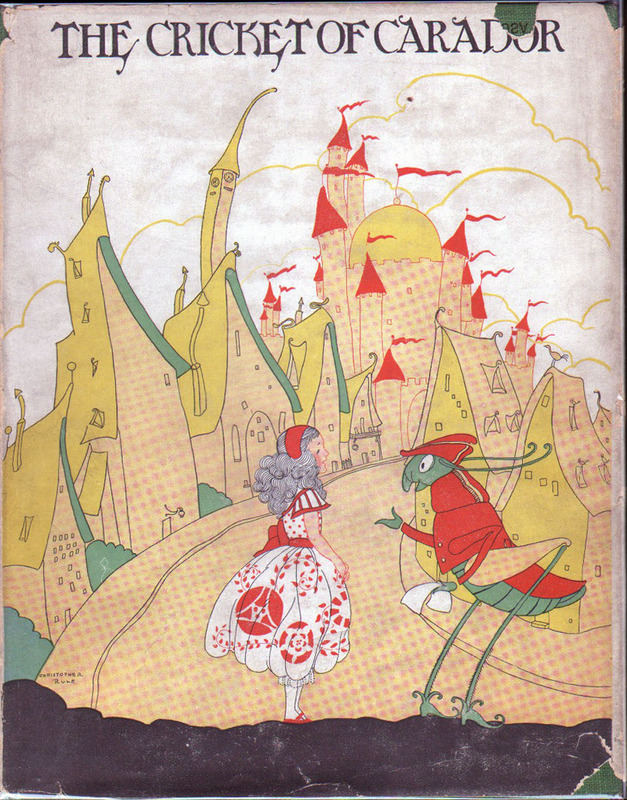 This fact has a second Timely connection no one realizes as the very first book published by Ogden Nash in 1925, the children’s book “The Cricket of Carador”, (co-written with Joseph Alger) was illustrated (and featured cover art) by none other than Timely staff artist Christopher Rule! 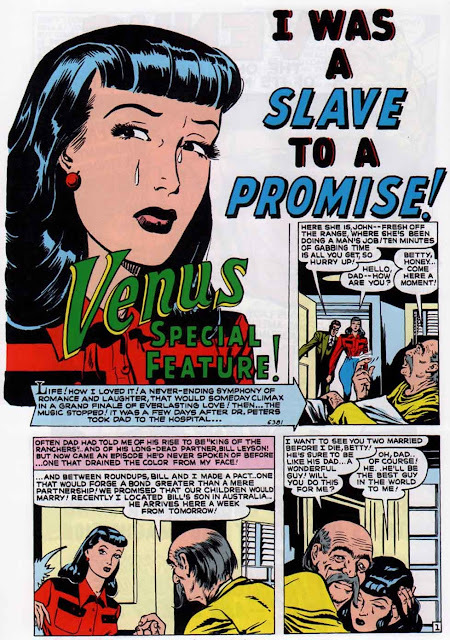 Let’s deconstruct the first nine issues of Venus and see what we can reveal. 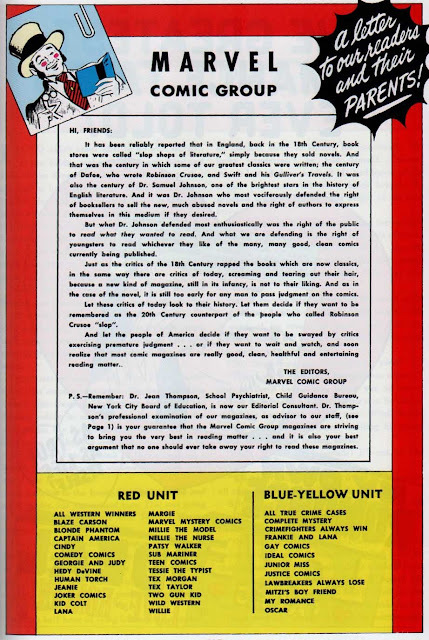 Interestingly enough, the first 9 issues were published by Martin Goodman's shell publisher Current Detective Stories, Inc. The last 10 issues which will encompass Vol 2 were published by Leading Comic Corp., splitting the volumes perfectly! 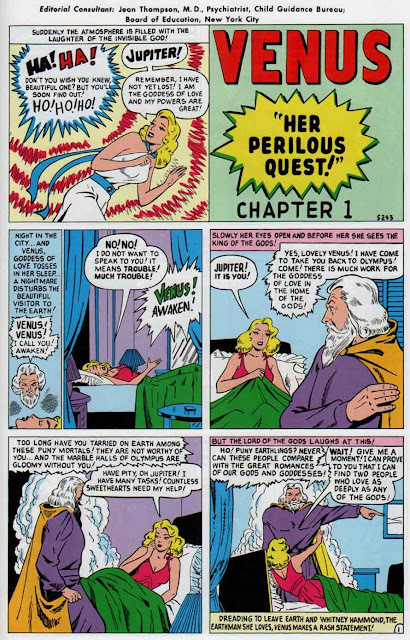 It almost seems that as soon as Venus changed genre to a hero sci/fi-ish fantasy character starting with issue #11, Martin Goodman purposely changed its shell publisher. 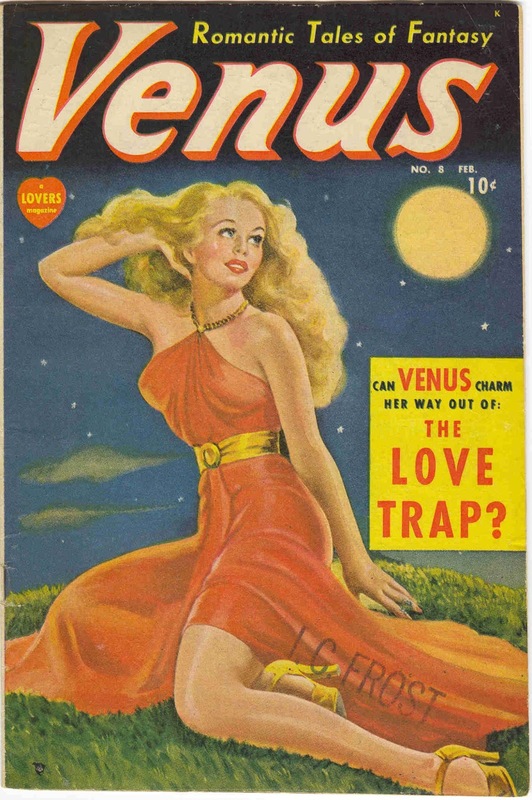 Creator-wise, the artwork on these early issues of Venus has long puzzled Timely art spotters. The assembly line methods employed by the Timely staff often lead researchers to speculate obscure pencil and ink separation of duties and even jam sessions where many different hands pitched in. For the Alter Ego article mentioned above, master Timely art spotter Jim Vadeboncoeur, Jr. came up with an index. Likewise, when I did the credits for the masterworks volume, I again solicited Jim V. and Hames Ware's help and opinions. I’m going to use that index and our subsequent discussions as an initial guide and add my own present thoughts where I think necessary. Story-wise, there are no author credits known on Venus except later probably Bill Everett, where I’m pretty confident he wrote his own stories starting with issue #13 onward. 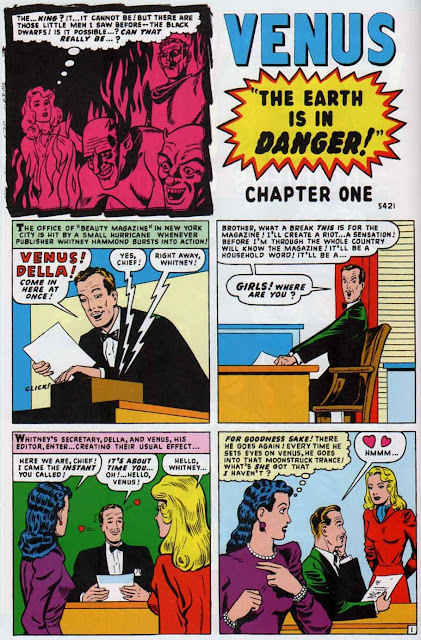 Stan Lee has mentioned somewhere that he may have written some Venus stories, but I’m somewhat doubtful, adhering to my long-held belief that he signed any and all stories he actually wrote. Look at his signed stories in issues #2,3,4 of the title Complete Mystery for contemporary examples of his authorship identification here: Complete Mystery. I have spent quite a lot of time poring over these issues and turned over every rock in my Timely research library, checking and cross checking art styles to a score of contemporary Timely teen artists who drew in this vein. Starting with issue #1, the cover is puzzling. To some degree George Klein is involved but I can't decide whether he penciled it. Let's dive right into the very first untitled Venus story. 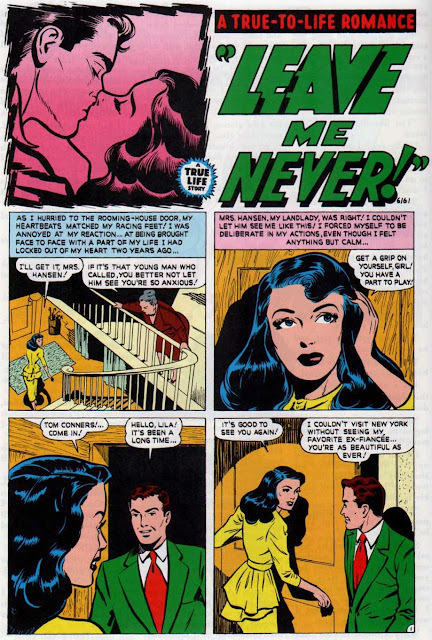 I’m very confident this artist is George Klein and Jim V. believes the inker is Lin Streeter, which I’m inclined to agree with. There's a slickness to the inking I associate with Streeter. Klein as the pencil artist seems fairly certain in my eyes. Not only do all the male faces have George Klein’s signature style but I’ve compared Venus herself to several signed Klein full page romance pulp illustrations from Goodman’s Best Love pulps and the female poses and art style appears to match. I even believe Klein assisted in background inks. Page 2, panel 5 has the classic “shimmering halo” seen in nearly every George Klein inked story including Fantastic Four #1 as well as the classic “Klein policeman” on page 4, panel 6. Returning to the cover, I think Klein is the artist and background artist. I cannot be sure he inked this. Usually known as an ink artist, having him pencil is what possibly has thrown so many art spotters for a loop for so long. So my interpretation on this very first Venus story is Geirge Klein pencils, possibly Lin Streeter inks and Klein on misc backgrounds, etc. Above left is solo George Klein pencils and inks from Martin Goodman's romance pulp Best Love Vol 1, #2 (Apr/43) p.11 Above right is solo George Klein pencils and inks from Best Love Vol 1, #2 (Apr/43) p.67. 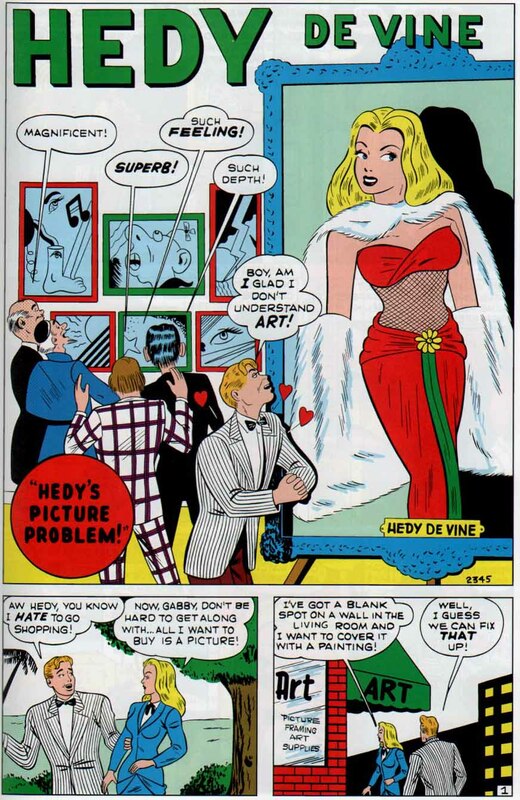 Both show Klein's figure positioning of the female form. 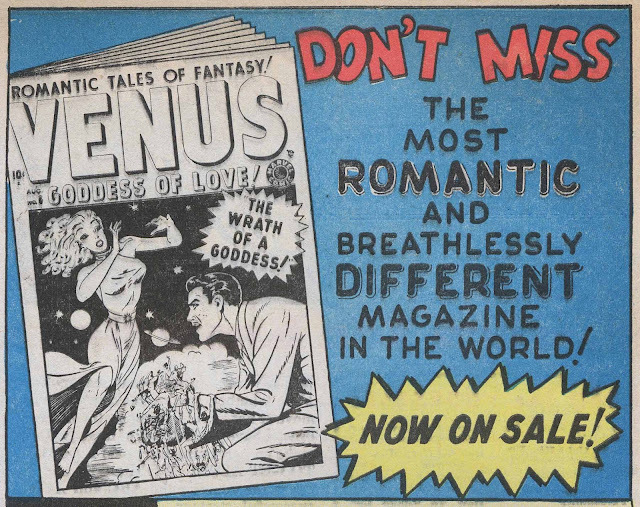 The woman's head on the right is actually in the exact same angled position as Venus' head in the splash! 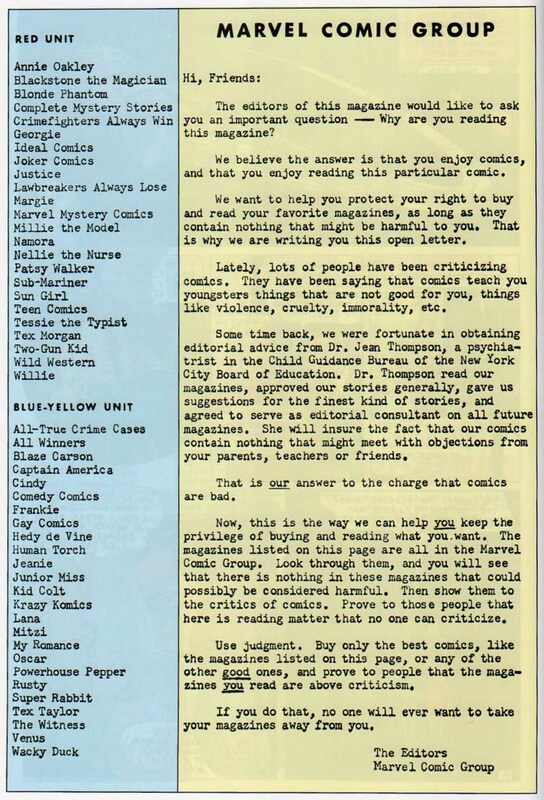 About five years ago I asked Stan Lee a general, non-art related question about the Venus feature Timely published. 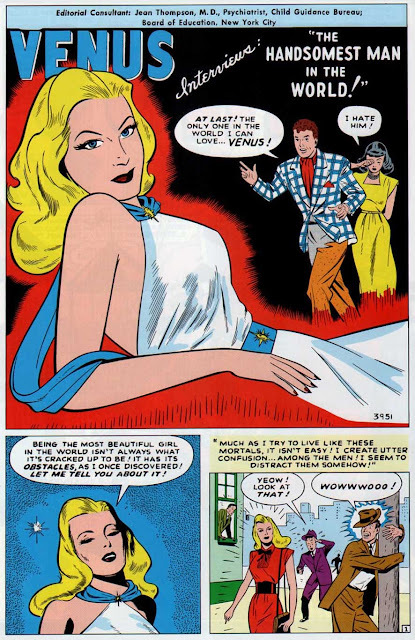 Without any prodding whatsoever on my part, Stan answered “Didn’t George Klein draw that strip?” This shocked me at the time as Stan’s memory is notoriously bad and if he was going to mention “any” artist associated with Venus, I would think he’d mention Bill Everett, the one artist singly associated with Venus above all other artists. Instead, the name of George Klein was recalled in conjunction with the feature 60 years after the fact. Alone it proves nothing and I was confident of George Klein in some capacity even at that time, but with what my eyes are now seeing, it makes for an interesting additional potential corroboration. The lead story sets the stage as teen type “romantic adventure” and it’s immediately obvious Venus has nothing in common with either Namora or Sun Girl. 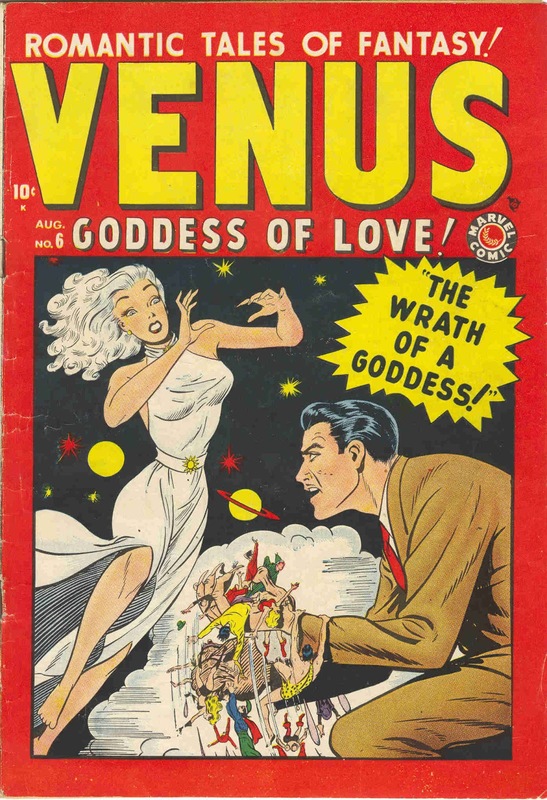 The plot sets off with mutilated mythology as Venus decides she is lonely on the planet Venus and is tired of ruling there. Instead, she wants to come to earth and experience life as a flesh and blood woman. Arriving in New York, she is hired to be editor of Beauty Magazine by publisher Whitney Hammond. That’s all you need to know. The second story has Venus’ handmaidens introduced, including Cleopatra, Helen of Troy and Salome. What they are doing living on Venus and why they aren’t dead after thousands of years, is beyond me. They were “human” after all. The second story looks to be likewise penciled by Klein but the inking is not as slick this time and I’m clueless although there are panels where other hands may have pitched in. In other words, I don't know who inked this. The filler story is Hedy DeVine and my guess is that this is Vic Dowd. On page 2, panel 2, artist Ed Winiarski’s name is sneaked into the story as the name of painter “Eduardo Winiarski”, a seeming referral to the fact that Winiarski was the other Timely artist who also drew Hedy DeVine. Although this sneak would lead one to think Winiarski penciled this, I don't really see it, unless he's completely buried under whoever inked this. I just see nothing of Ed Winiarski here. The issue closes with a full page “Hey Look!” written and drawn by Harvey Kurtzman. 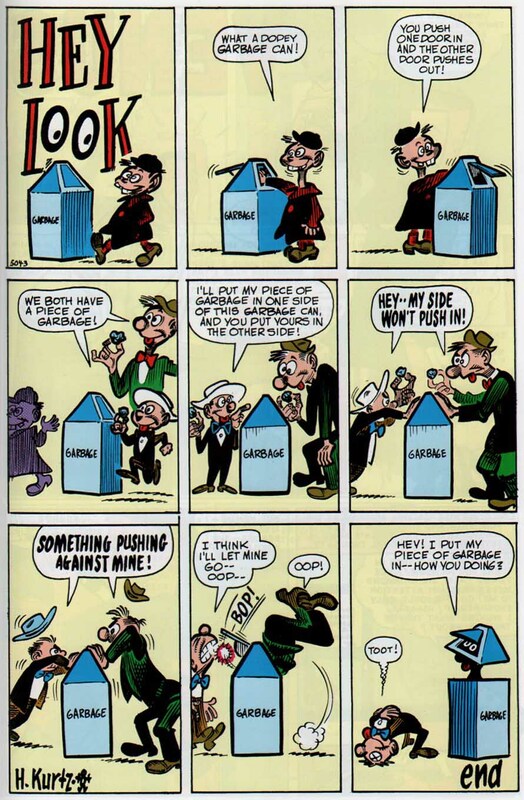 Kurtzman drew around 150 of these humor spots from 1946 to 1949 in just about every humor title Timely published and met his future wife Adele there, a proofreader at Timely since 1946. 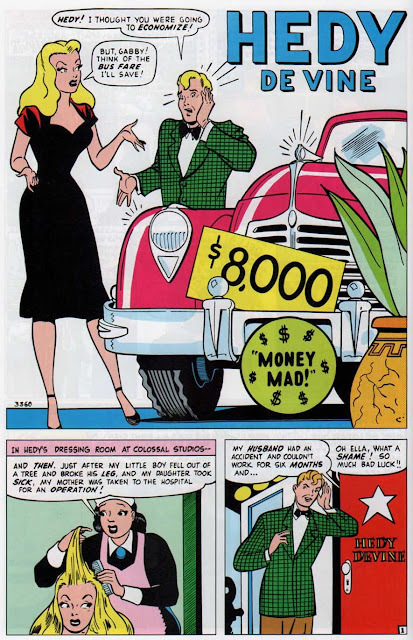 Finally, the full-page pin-up at the end of the issue appears to be George Klein. For issues #2 through #9, I’m going to concentrate primarily on creator credits and downplay plot points and stories unless there is something notable to mention. The cover to issue #2 could be anyone. There are Klein-like elements, especially Venus’ face and the bus driver but there could be other hands here. 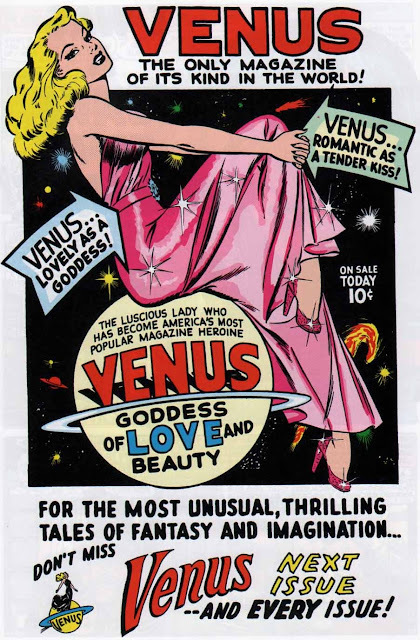 The lead Venus story is once again George Klein. The inking is not as slick as before and while my initial impression was that this could actually be pure Klein pencils and inks, I don't believe so. The splash certainly has Klein's touch, though. This first story plot lacks any supernatural elements and is 100% a teen-humor type story as Venus travels to a small town and causes a ruckus with her beauty. This could easily pass for an issue of Millie the Model, Tessie the Typist, or “any” Timely teen girl title. So the editor and writers really didn't know what to make of this title yet. 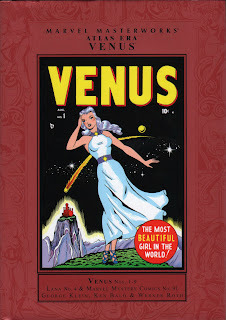 Take note of that shimmering ink line effect around Venus. While this was a common technique used at the time by many artists, no one did it like George Klein! The second Venus story is again George Klein. The ink looks a bit slicker and I can’t be certain another hand is here also but Klein as penciler and inker is certain. 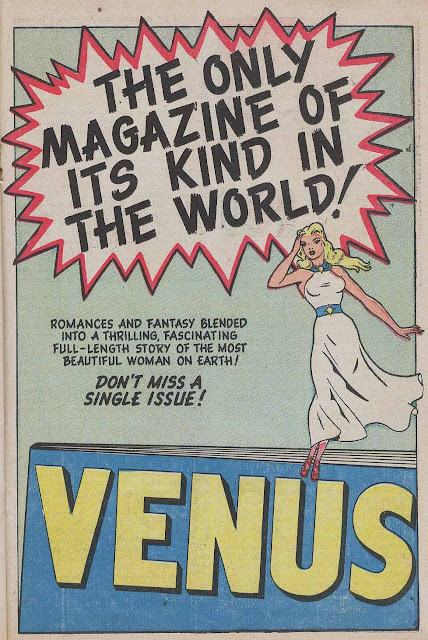 Story wise, Venus’ beauty again causes a riot, this time at a magazine printing plant. 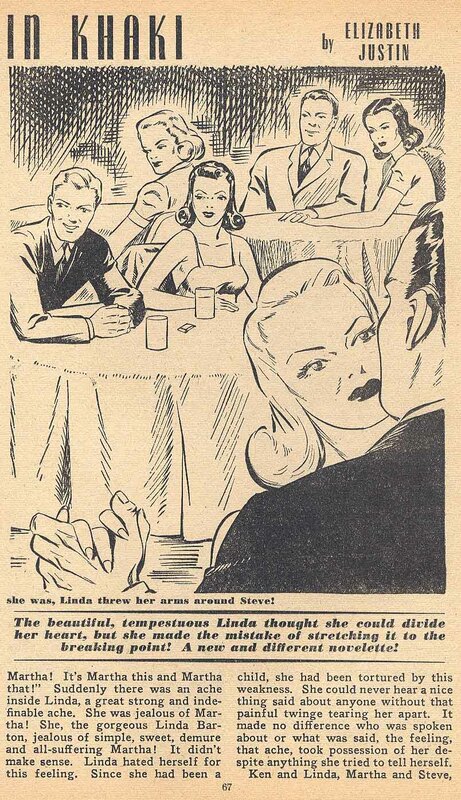 Hedy DeVine is the filler again and I think I’m seeing ever-so slightly the hand of Christopher Rule in a few panels. Otherwise, I don’t know who drew this. A completely buried Ed Winiarski? I just cannot tell. The third Venus story shows George Klein again and like Hedy above, perhaps the subtle hint of Christopher Rule in a few panels. In this story we finally see some supernatural effects and the last panel …. (ahem) …. shows a scene that … (um) … wouldn’t pass the censors in a code-approved comic book! 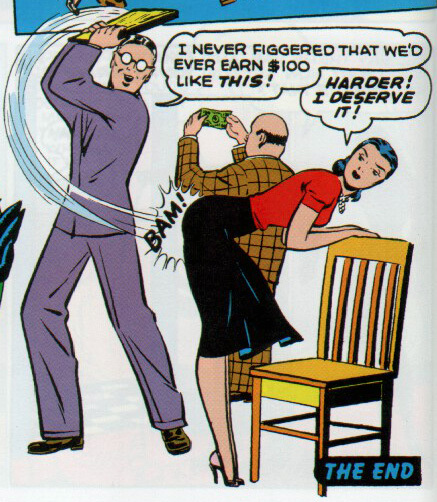 I guess we'd call this a "spanking panel"
A guess on the cover to issue #3 above is Ken Bald pencils, but otherwise unknown. In issue #3 a new artist takes over and Venus is drawn a bit more realistically with a heavier plot emphasis on Venus’ mythological background. The main artist on the first story here may be Ken Bald. I don’t know who the inker is but pages 8 & 9 give a hint that George Klein is back helping out. 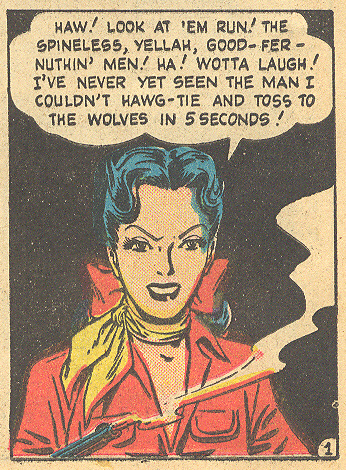 The Hedy DeVine filler I believe “is” Ed Winiarski on the pencils this time. The inks are unknown. The one-page Venus “special feature” is unknown to me but Jim V. suggests Don Rico. 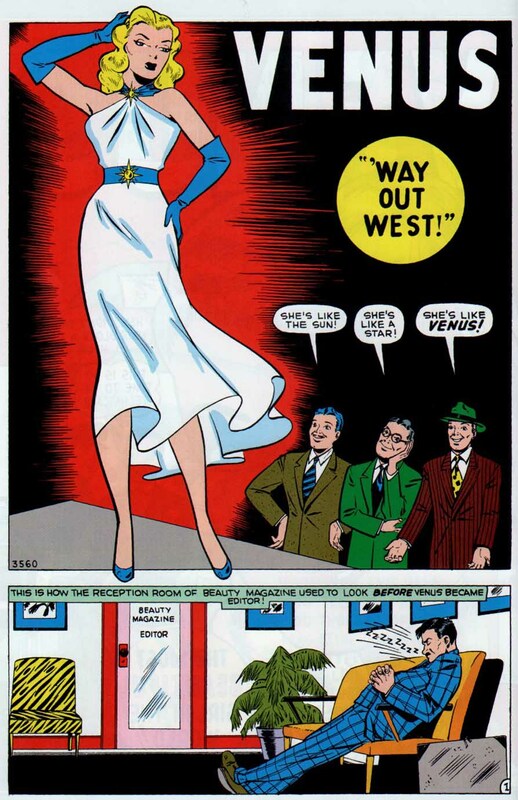 It actually looks like more than one artist as the head of Venus look like it was drawn by a different artist than the rest, someone I've seen over and over in books of this period, but haven't been able to put a name to. The feature gives more mythological depth to the character than the stories have so far. 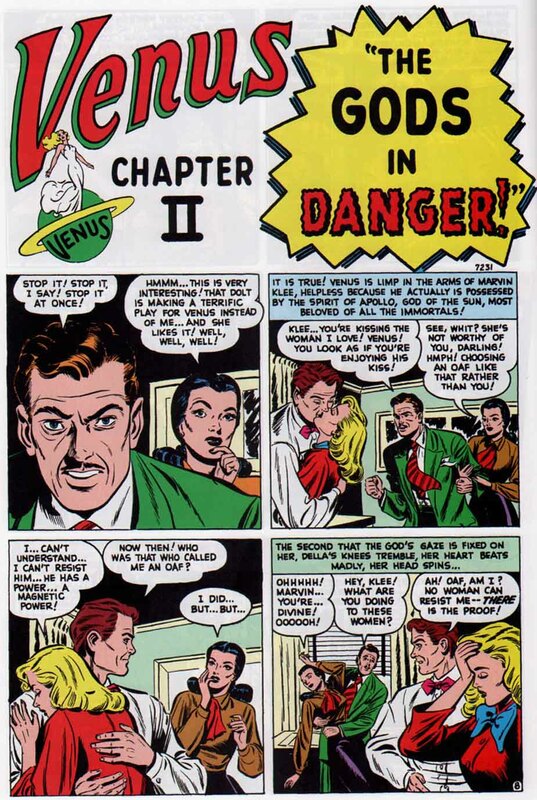 The second story again may be Ken Bald with a different inker, or maybe not, looking at this right now I'm wondering if I'm seeing Morris Weiss penciling this! The art is much looser than I expect from Bald, who was always a bit stiff, while Weiss was cutting his teeth on Tessie The Typist for years. Mythology is heavily mixed into the story plot as we meet the Apollo, the god of the sun. The romance between Venus and publisher Whitney Hammond finally begins to mutually bloom in this story. So finally we get some character development. At this point, Venus is seemingly cancelled along with Namora and Sun Girl, the girl-hero adventure type comic book experiment apparently a failure. Two inventoried Venus stories will appear, though. 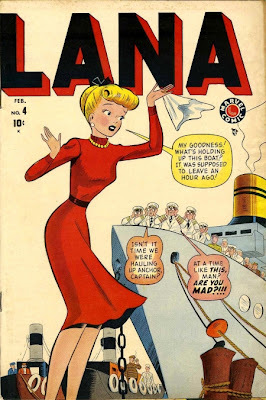 The first in Lana #4 (Feb/49), one of the multitude of teen titles, has a job # placing it later than any stories in issue #3. 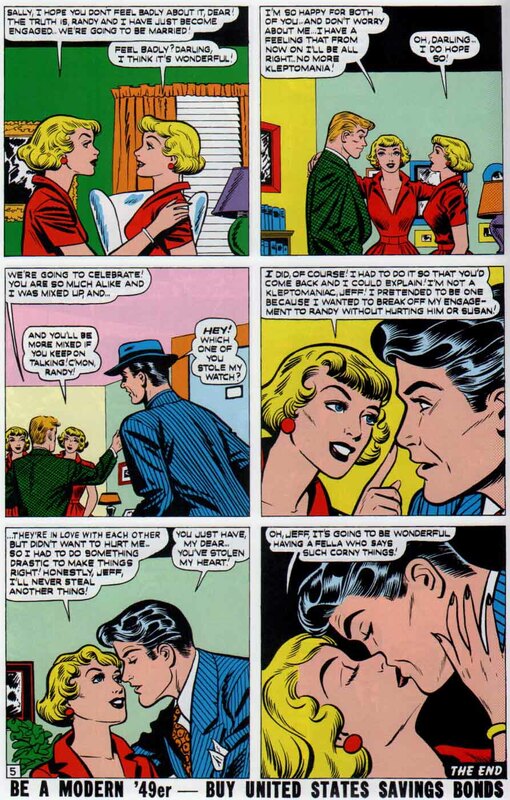 The story is a short, silly 4 page joke type filler story and the artist here in some capacity appears to be George Klein. 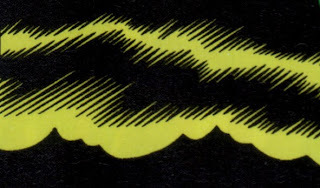 There may be an inker here and a face or two look very Rule-ish, but otherwise I’m stumped. The last inventory story appears in Marvel Mystery Comics #91 (Apr/49) and is a standard 9 pager with pencil art that reminds me of Ken Bald from issue #3, perhaps with yet a different inker. Or not. It's just so hard to tell when there are still unknown artists with art styles attached to them. The tendency is to give the art a name, but "unknown" is often the better and proper choice. 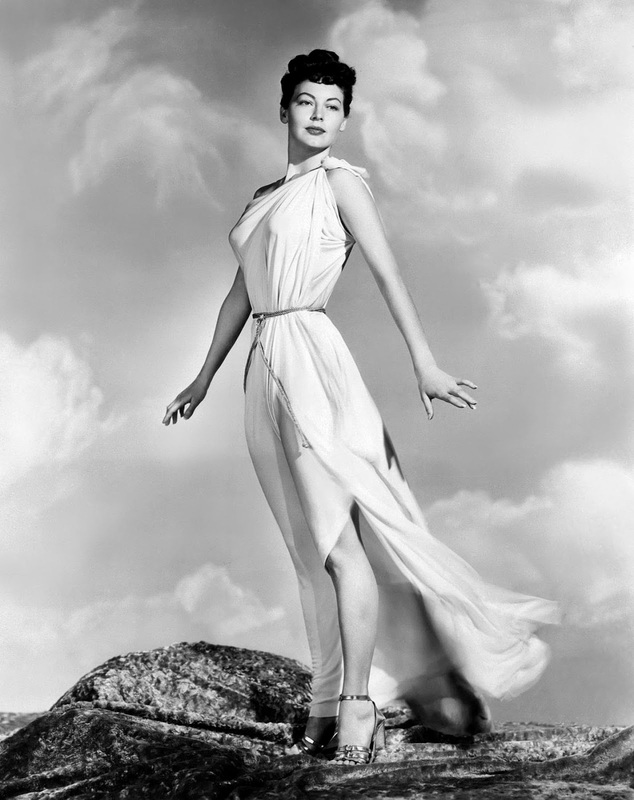 We meet the goddess Juno this story in a plot of mixed up romances and infatuations. The job number of this story places it concurrent with what happens next, the revival of Venus’ own title with #4, also cover dated (Apr/49). The cover to #4 above is unknown but there is a Dan DeCarlo hint to Venus’ face. The lead story “Whom The Gods Would Destroy” (a title Stan Lee would use again in Thor in the Marvel age) gives us the god Sampson, come down to earth and made mortal. 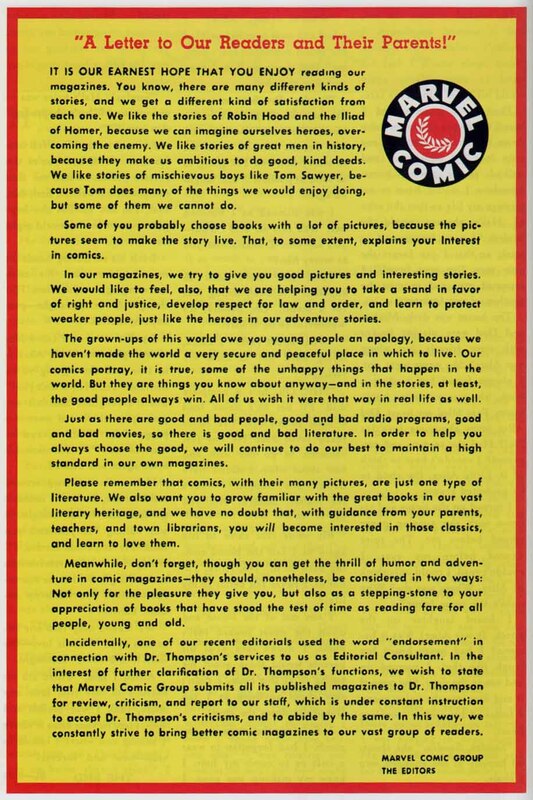 The "Marvel Comic" bullseye logo branding is also on this cover, a reverse of Goodman's old Red Circle pulp logo. Issues #4,5,6, & 9 in this volume will sport this logo. I have one recurring question ... why does the writer of this feature seem to think the planet Venus is “light-years” and “eons” from earth? Ok, a science lesson to Timely scriptors......The closest distance of the planet Venus to earth is 26 million miles while a light year is 5.8 trillion miles! And an “eon” is a unit of “time” not distance. 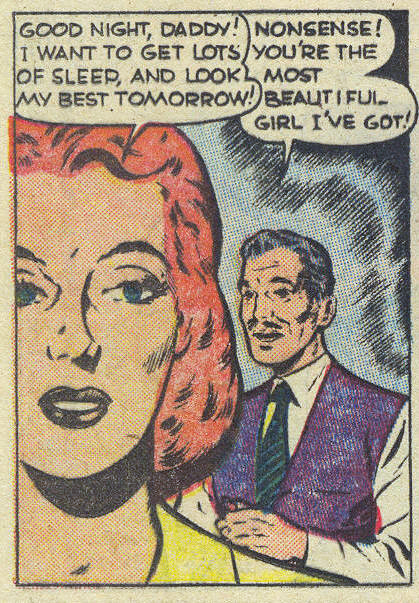 The art in this first story is a hodge-podge to me. 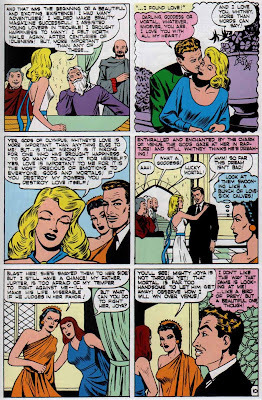 Ken Bald (or the artist we are possibly calling Bald in issue #3) seems to return but I again I believe I see the faint hand of George Klein on several pages, again as a penciler, not inker. Jim Vadeboncoeur Jr.. throws Peter Riss into the possible inking scenario. 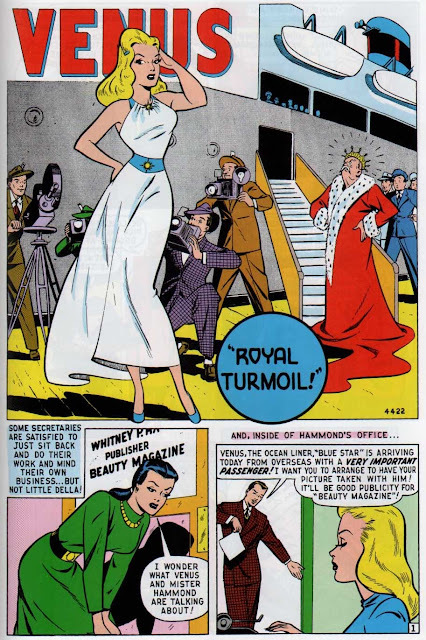 The 3rd Timely anti-Wertham editorial follows next, seen on Timely issues dated April and May 1949. 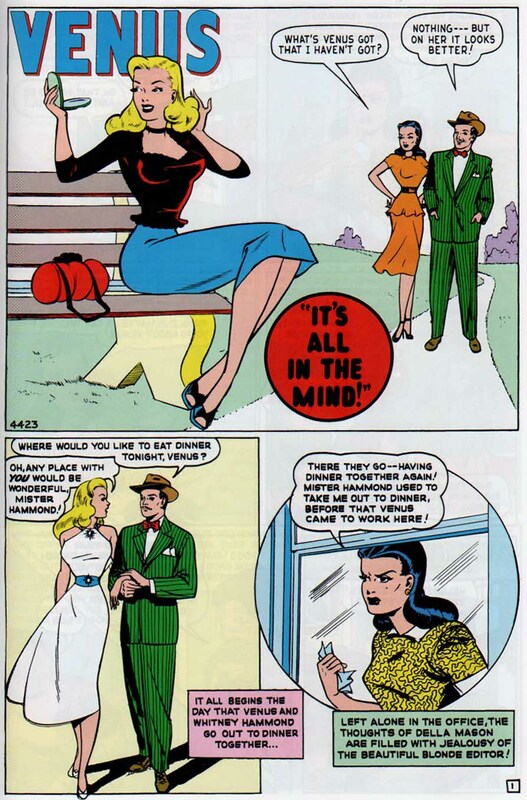 The 2nd editorial never appeared in this title, dated on March 1949 issues. 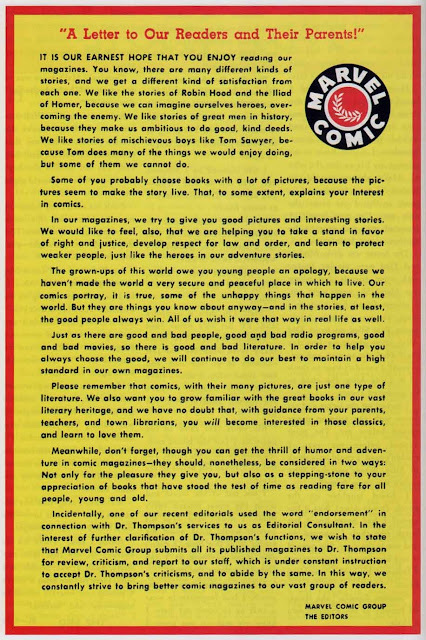 That editorial was the famous David Wigransky editorial, a 14 year old comic book reader whose letter “Cain before Comics” in July 24, 1948 issue of The Saurday Review of Literature took Wertham to task on his ridiculous anti-comics crusade. 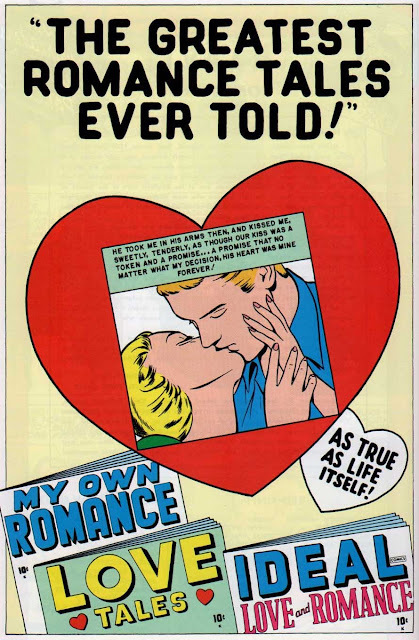 We also get a net full-page house ad promoting Timely's nascent romance line. At this juncture of Venus #4, cover date April 1949, Timely had 4 ongoing romance titles. My Own Romance (just changed title from My Romance), Ideal Love and Romance (will change title to Love Romances with the next issue), Love Tales and Lovers, which will both debut next month. Strangely, Lovers is not even in this ad. The second Venus story lets go of any mythology and reverts back to a gag teen-humor type plot. The story again seemingly has the hand of Christopher Rule about it along with diverse hands. It almost appears he is penciling only some female heads. 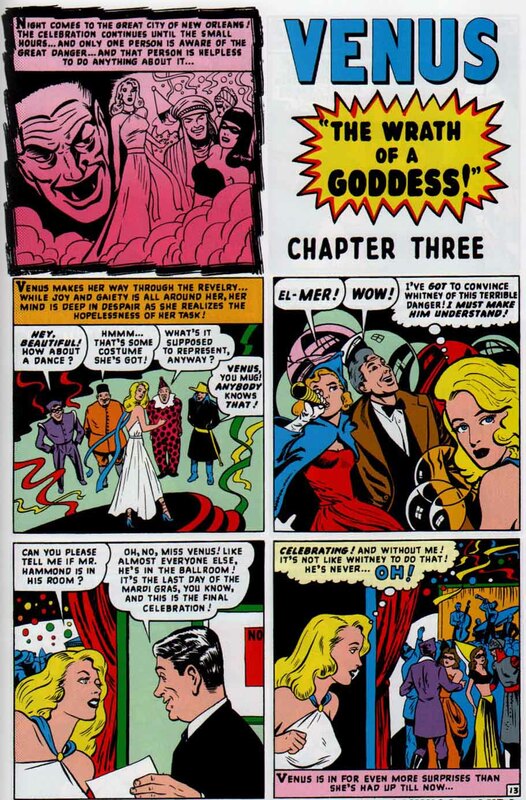 Page one looks like Klein and Rule together then Klein vanishes and some Venus heads look like Rule. 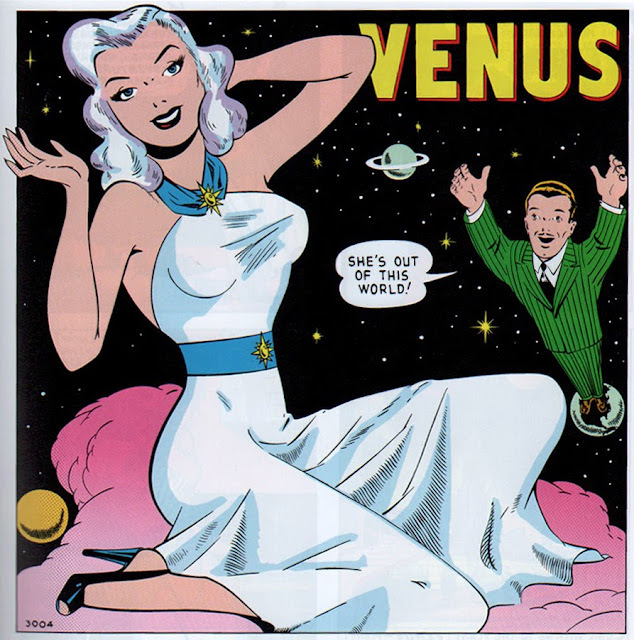 Venus in the splash almost looks like a complete Dan DeCarlo pose. A real mish-mash. Everything about this story, from the splash panel onward, makes it look like it would be better suited in a concurrent issue of Millie the Model or Hedy of Hollywood. Harvey Kurtzman contributes another “Hey Look” one-pager next and the 3rd story is again a typical teen-humor story as Venus is sent to a psychiatrist to relieve her of the delusion that she is “Venus, the Goddess of Love”. The usual shenanigans happen as the doctor falls head-over-heels for her and the overall tone is one of Millie or Hedy type teen humor. 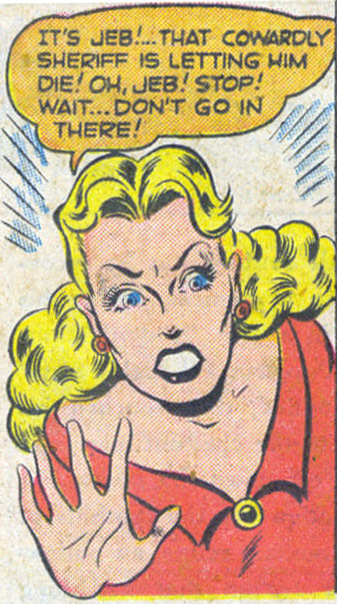 Even the splash panel is classic teen-humor fare! This is another jam job where I see numerous styles and possibly Bald and Rule. It seems that both the editor and the writes don't know what to do with this character, shifting her between teen-humor type stories and light fantasy fare with a humorous bent. We will now get our first shift in tone. With issue #5 we now make a departure from the four previous issues of teen-humor short-story type plots. You can usually genre-index a book by its back-up stories. The first 3 issues used Hedy DeVine fillers, a teen-humor character who had her own title from 1947 to 1952, showing that the editor considered this title a "fantasy" teen-humor type title. 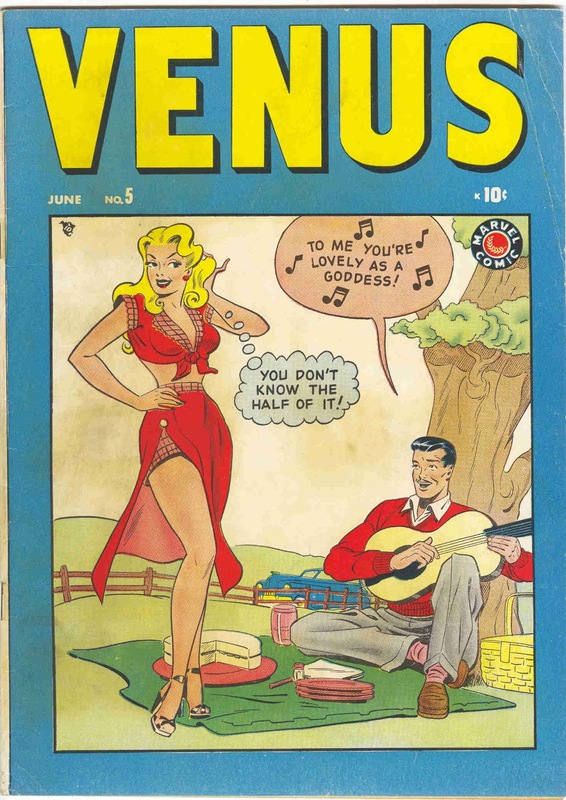 The cover of #5 does continue this vein and while the cover artist is unknown to me, Venus’ face hints at Rule. I could also guess Bill Williams, but nothing definite, I just don't know. But inside there is a change. The stories from now on take on a leap in sophistication. The Venus tale is one long 19 page mythological story broken up into three chapters. 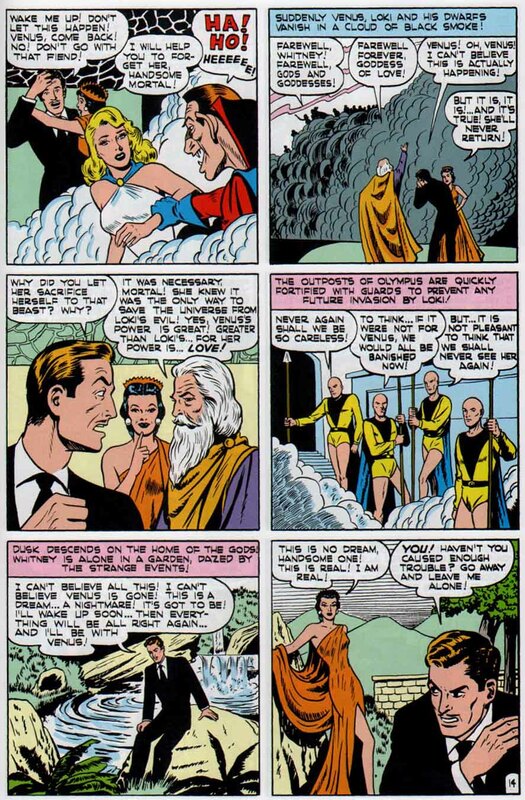 Venus is up against the King of the Gods, Jupiter, and has to prove to him “true love” exists on Earth, otherwise he wants her to return to Olympus. 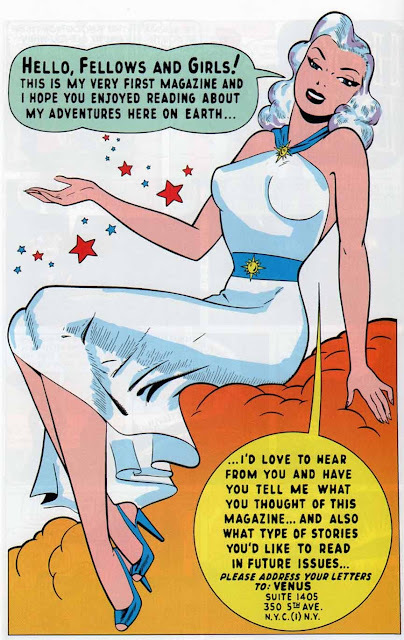 No mention of the planet Venus this time so Venus' backstory is being changed.. Has the writer finally done some research and given up the silly idea that Olympus is on the planet Venus? Genre-wise I call this romantic-fantasy. The ugly Timely house grid style (my phrase) splash is in evidence on page one. 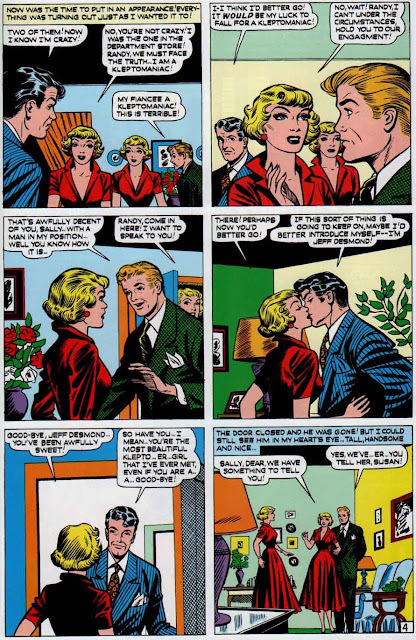 This was done for a short time in mid 1949 whereby the left panel at the top has a preview panel from elsewhere in the story and the title is squeezed into the right top panel. I've always found it terribly unattractive. It's also the likely reason why inventory stories from this period later had their splash panels re-drawn throughout 1950. 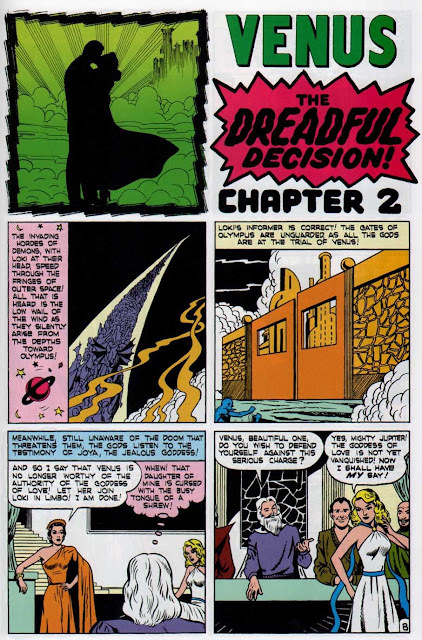 Those frequently seen genre stories were older inventory from this Timely house grid style that artists like Mike Sekowsky, Christopher Rule, Syd Shores and even Joe Maneely had to update with new splash panels for publication. Immediately I’m puzzled. Who is this? I see many different inking hands. I run through stylistic similarities in my head… Klein? No. Bill LaCava? Similar, but no. A jumble of unknowns and not-yet-identifieds, as well as possibly Pete Tumlinson and George Klein.. But on page 17, I think I see something very surprising. This looks like Joe Maneely in panel 4! Is this even possible??? Joe Maneely at this time was traveling into the city from Philadelphia several times a week. He would not move to New York City until December of 1949. 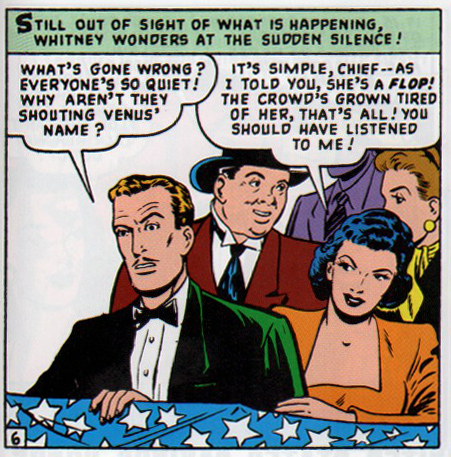 Street and Smith had just closed down (or was in the process of closing down) their comic book division and had kept Maneely steadily employed since he left the Hussian School of Art in November of 1947. At this same time Maneely was also getting work from Hillman and Pflaum (on Treasure Chest). But Timely? Not that I have ever seen before. 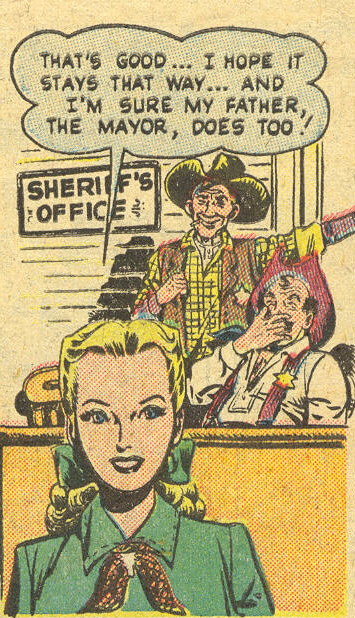 In fact, the earliest Joe Maneely artwork I've ever seen at Timely was in Western Outlaws and Sheriffs #60 (Dec/49), "The Kansas Massacre of 1864" (8 pages), pencils and inks. 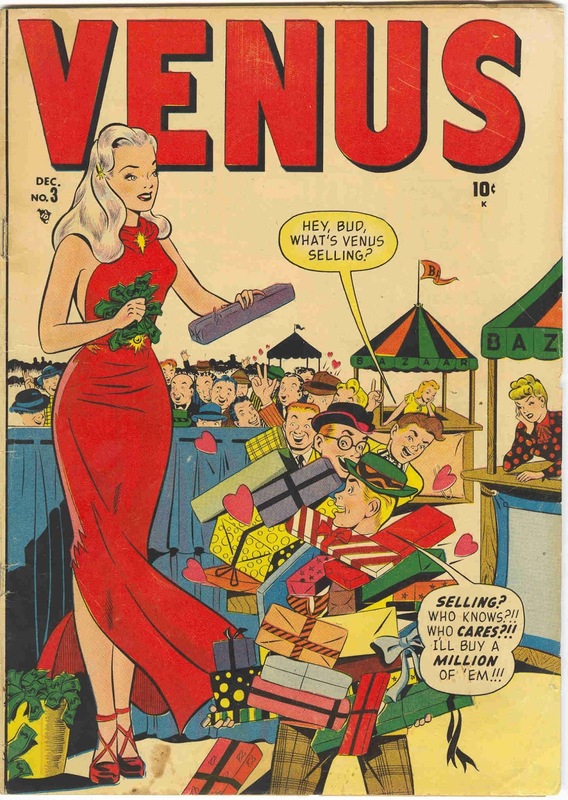 The cover date of this Venus story, June 1949, places the stories on sale date in March, and it's actual rendering possibly as far back as December 1948 or January 1949, way too far back for me to be able to legitimately consider Joe Maneely. Further, this was a staff job and even if Maneely was dropping in at Timely looking for work, would he have been in a position to do a few panels as a dropping-in freelancer? It makes no sense on the surface, although far-fetchingly, he certainly could have dropped in, been hanging out watching and chatting up colleagues, and helped out within the spirit of camaraderie. He had actually done that in the classic Black Rider story "The Mystery of the Valley of Giants! ", that 18 page jam-job in Black Rider #8 (Mar/50), created during the waning days of the Timely bullpen in late 1949 and featuring diverse hands such as Syd Shores, John Severin, several unknowns and seemingly Joe Maneely on pages 2,3,7 9-18. (That's the issue with the photograph of Stan Lee as the Black Rider on the cover!). Still, the "drop in and help out" scenario seems doubtful. The problem though is the actual artwork. It still bears a distinct resemblance to Joe Maneely to me. 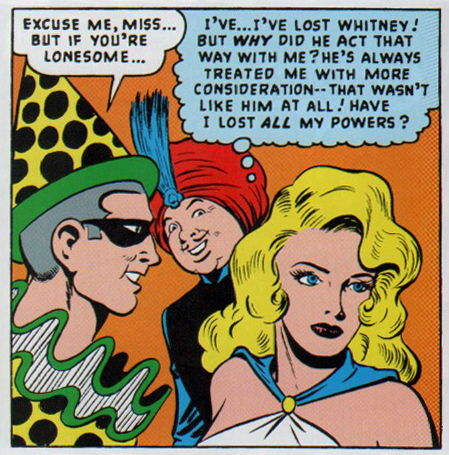 Venus looks awfully similar to the red-head in the Girl Comics #3 splash. Della on the right of Venus is a typical Maneely female image as seen below in 3 different panels. I'm not too sure why but to me this Venus panel is very similar to the Maneely romance splash “Second Fiddle” in the rarely seen Girl Comics #3 (above), a story he did not draw except for the splash. 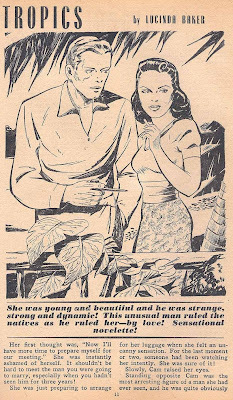 There are at least ten instances of Maneely drawing splash panels for others in 1949 (or slightly earlier) era books, clippings of which I've discovered in Maneely’s own files. As I mentioned, this was done to update the look of inventory stories away from that ugly Timely house grid style. 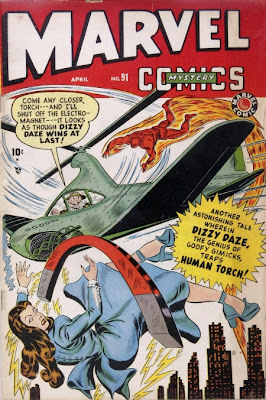 If I’m correct, this story would be placed as the earliest known Maneely Timely art appearance by cover date, June/49, eclipsing his previous earliest known . 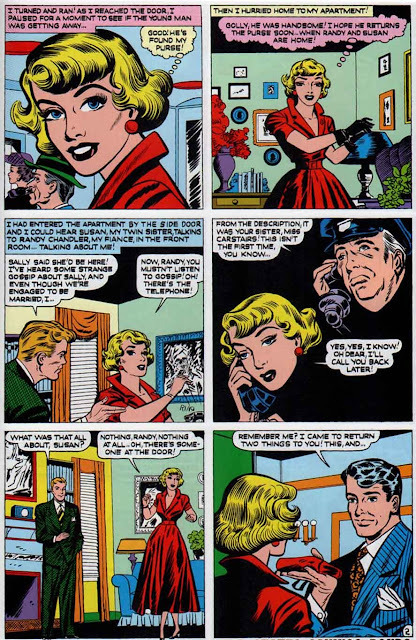 It also means Maneely was freelancing for Timely as early as January, 1949. Work at Street and Smith was drying up and the line closed down by April. It was logical for him to be here as he scoured for work at the dawn of his career. Or I'm wrong and am looking just too closely at an artist who bears a vague similarity to Joe Maneely. 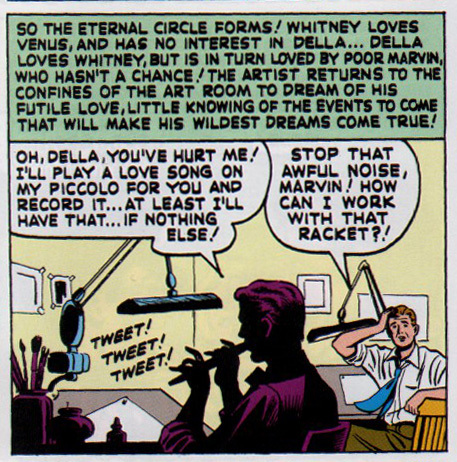 At the end of this piece there will be a postscript that revisits this Venus #5/Maneely problem. 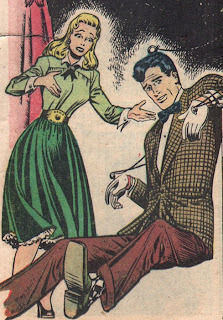 The back-up filler is a romance story. The art for, “The Heart Within Me – Dead!”, is possibly Mike Sekowsky doing the barest of pencils and inked possibly by more than one hand. Early on page one, I don’t know (Lin Streeter?) but then perhaps Christopher Rule appears on pages 2-4. It’s actually hard for me to tell and the Sekowsky is almost impossible to see. It may be the barest of pencils or even breakdowns. The text story is also a romance tale, “Stolen Love”. 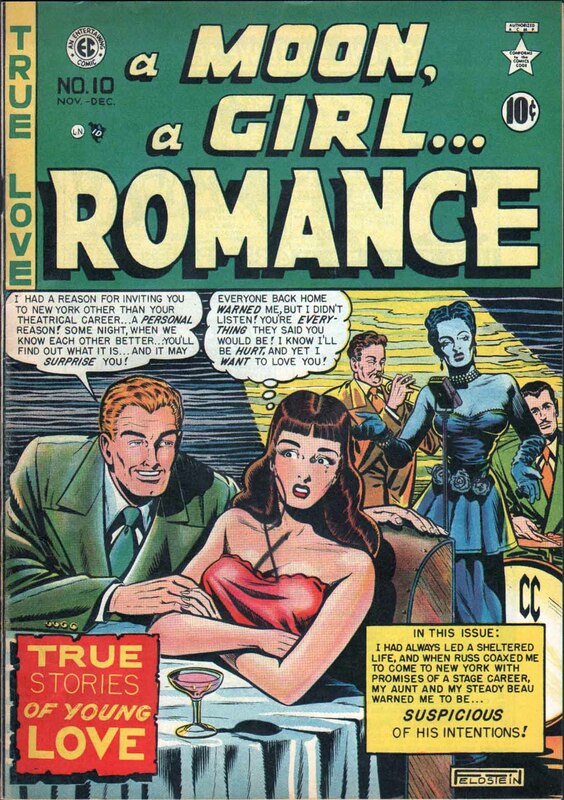 This goes a long way in placing this and subsequent issues (as we will see) squarely in the “romance-fantasy” genre. Also in this issue is the 4th anti-Wertham editorial where Lee and Goodman mention literary titles of note (Robin Hood, The Illiad, Tom Sawyer) in their attempt to explain to the young readers that their “right” to choose their own reading material is being infringed upon. The cover to issue #6 is mostly unknown to me.The figure of Venus, specifically her face, hints at Syd Shores, but that's about all. It hints.I don't see Shores in the man on the right. Issue #6 is another 19 page story broken up into three chapters. 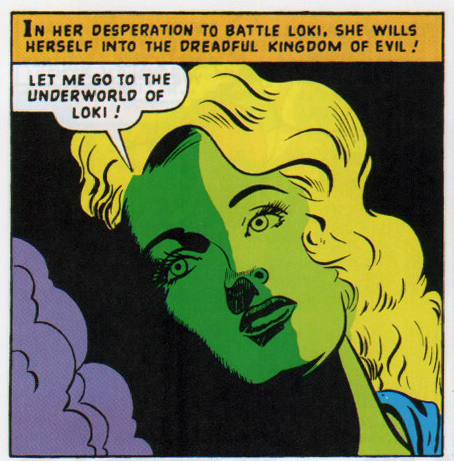 Venus is placed in a Mari Gras setting against the Lord of Evil and the underworld, Loki! Yes, Timely is now mixing pantheons of mythological deities as Norse gods cavort with the Gods of ancient Rome and Greece. For the second issue in a row panels exist that could be Joe Maneely, or the Joe Maneely-esque unknown guy. 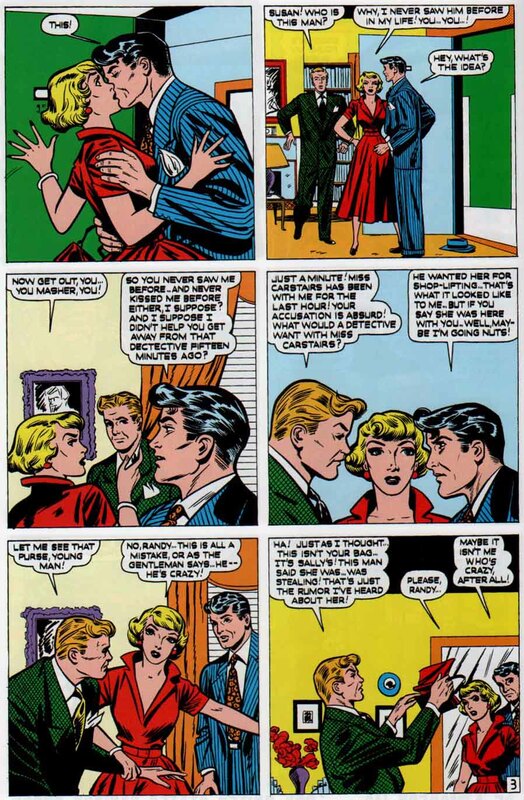 It’s even more difficult to see as a slew of different inkers have descended upon the story to make it a jarring spectacle of styles (but I'm going to point it out below). I see Valerie Barclay, Pete Tumlinson and maybe Al Hartley. Jim Vadeboncouer possibly sees Pierce Rice, Chu Hing and Don Rico. 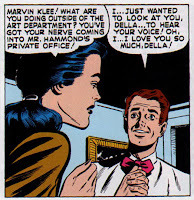 I even see George Klein doing some backgrounds. And there are unknowns. Incredible. A Timely staff round robin. And now some Maneely panels of similar criteria. 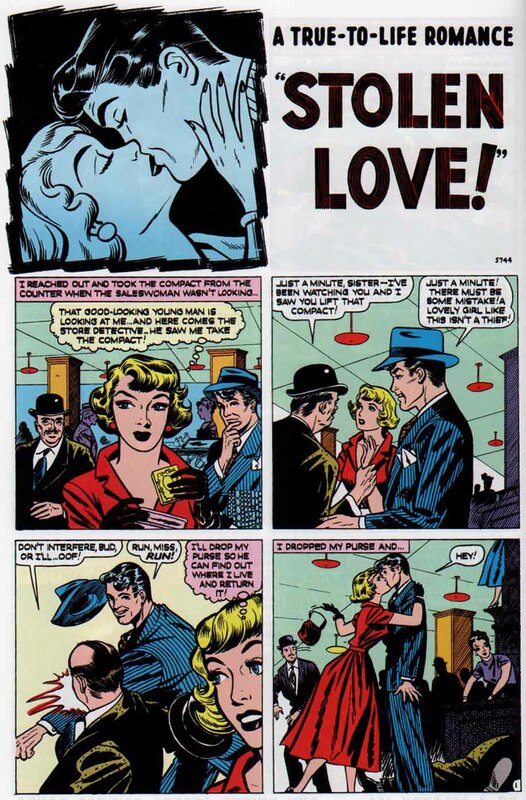 These 2 panels below were taken from Maneely splash panels done for other artist's stories. I long suspected them to be Joe Maneely's art but got confirmation when I found them actually clipped out among Maneely's own personal effects. Overall, my whole take on this pseudo Maneely artist is that I just have no idea. The text and back-up story at the end are both straight romance. Mike Sekowsky and Christopher Rule render a narrative about a beautiful kleptomaniac, “Stolen Love”, in a gorgeously slick fashion. Sekowsky/Rule is a wonderful romance art combination as Sekowsky’s pencils usually produce bold demonstrative figures. Rule’s slick inks then provide a sheen that is derived from fashion illustration art, his main forte’. Here's the entire story. 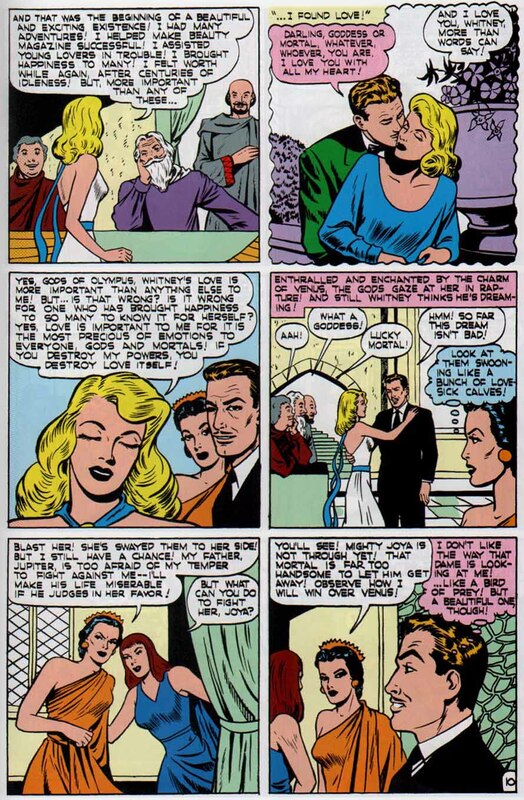 On the last page Rule completely redraws the woman's head in the last 3 panels. Issue #7’s cover starts a trend of unsigned painted covers for 2 issues. Others can be found in concurrent titles like Patsy Walker, Junior Miss, Georgie and Sports Stars/Sports Action. Louise Altson, Peter Driben and Allen Anderson painted some of these covers but I cannot say who painted the cover of Venus #7. The cover (and #8) also has the well known “A Lovers Magazine” heart shaped colophon, a sure sign that these were now considered definite romance (really romantic fantasy) issues by Timely. Approximately sixty-three covers across the line sported this symbol between Oct/49 and July/50, and all but 4 of them were photo covers. 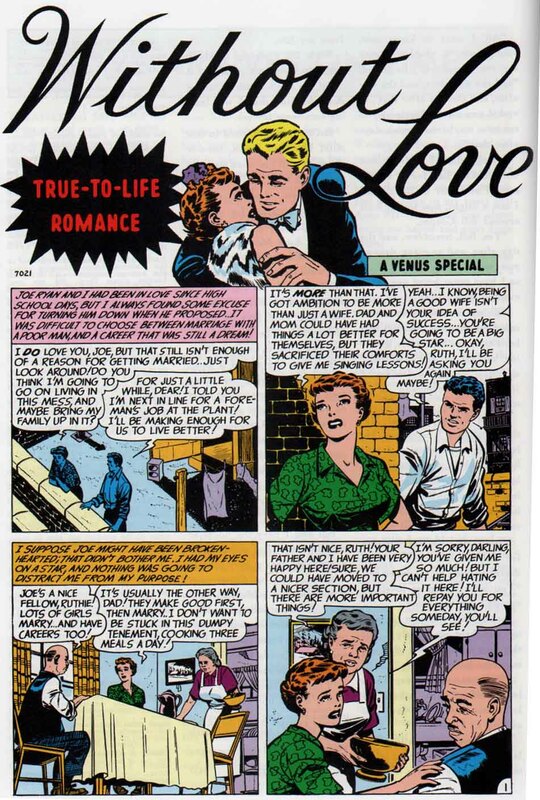 The cover date of November 1949 also puts this issue right in the middle of that startling entity known as the "Timely Romance Glut," the largest subset of the greater, "Industry-Wide Love Glut." 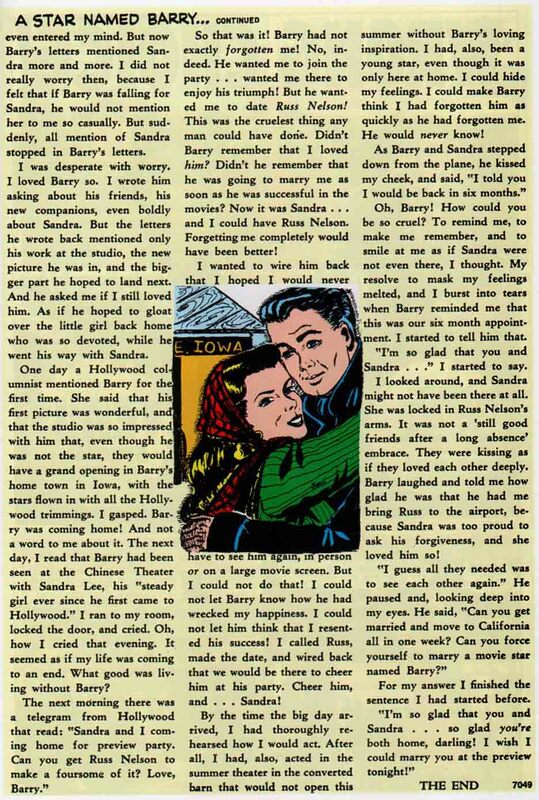 There were exactly 22 Timely romance titles being published at this exact month with 8 more to be added by January 1950. 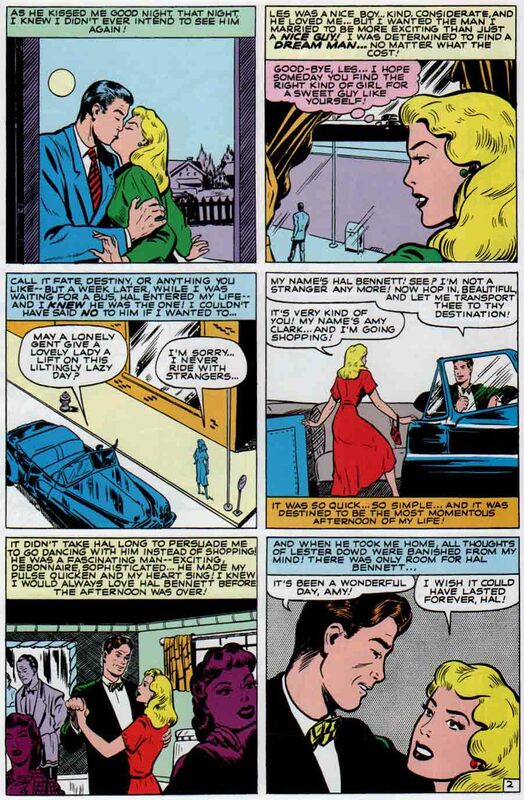 Here we have a 2-part, 17 page story where once again the blossoming love affair between Venus and Whitney Hammond progresses. 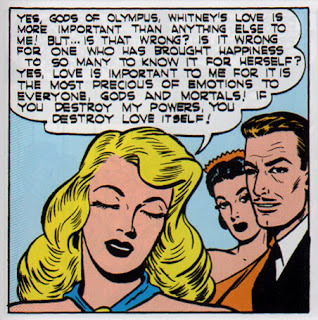 The Timely writers are also getting a better handle on Greco/Roman mythology and the entire issue takes place on Mount Olympus as Venus and Whitney are carried there for Venus to stand trial for loving a mortal. Hmmm.... that sounds vaguely familiar, doesn't it? The art is a jam-session lover’s delight! Early on I see Val Barclay, Pete Tumlinson, Christopher Rule and possibly Don Rico and even Bill Walsh. I also see backgrounds by George Klein and hints of Chu Hing, Pierce Rice, Morrie Weiss and F.R. Sieminski.. I even think I see Ed Winiarski is one single panel! For the third straight issue, once again I'm strainingly seeing evidence of Joe Maneely in select panels. I’m certainly not sure I’m correct. How a long-distance freelancer could pitch in on a bullpen jam story, is a puzzle that still disturbs me. 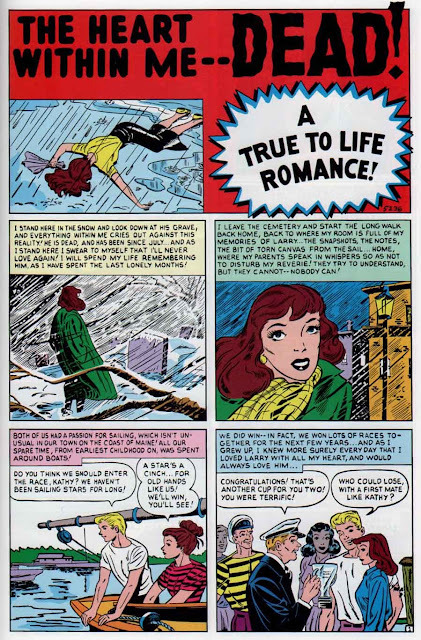 Below on the left is page 10. Below in the right is panel 3, with a Christopher Rule Venus face/head. Below on the left is page 14. Below on the right is panel 3, with what looks like an Ed Winiarski man's head. The back-up is a 6-page romance story about love and deception that I enjoyed a great deal (the romantic that I am!). I didn’t even see the telegraphed ending, although in hindsight it was obvious. 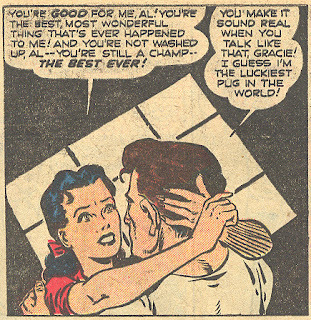 (The “blind” romantic that I am!). The art is unknown and I’m tempted to wonder if this is Nina Albright but Albright is better than this. So I don't know. My guess on the cover to issue #8 is that this may be (and likely is) by Peter Driben, a well-known industry pulp and pin-up artist that Martin Goodman used quite often on his crime magazines, 1942-1945 crime digest paperbacks, painted comic book covers in 1949-50, and girlie-related humor publications, both bedsheet and digest types in format. Driben is probably best known for being the main cover artist for Robert Harrison's notorious string of girlie magazines Beauty Parade, Eyeful, Titter, Wink, Whisper and Flirt. 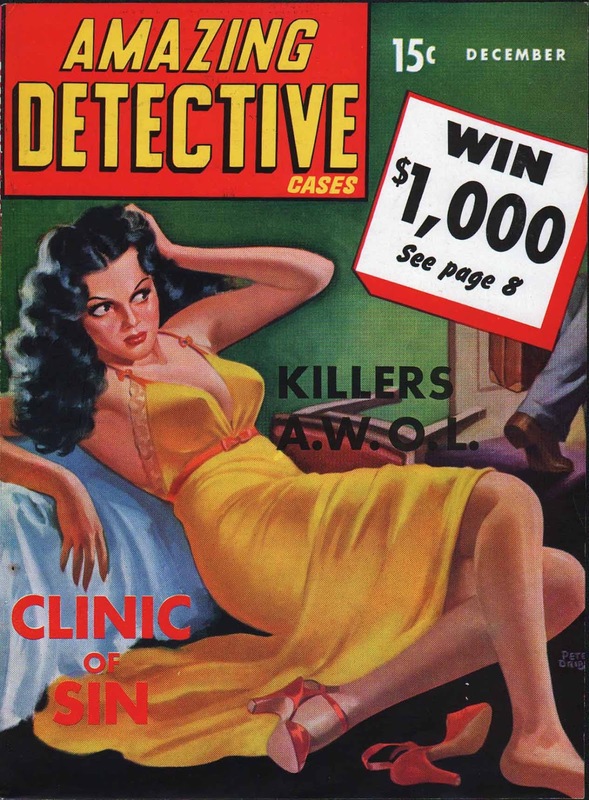 Here he is on the cover of Martin Goodman's longest-running true-crime magazine, Amazing Detective Cases. The poses are nearly identical. From cover date November 1941 to November 1942, Goodman used painted covers 11 times across 3 different titles. Other cover artists used were Norman Saunders and Cardwell Higgins. Issue #8 is basically a 17 page, three chapter romance story that happens to feature Venus and Whitney Hammond. 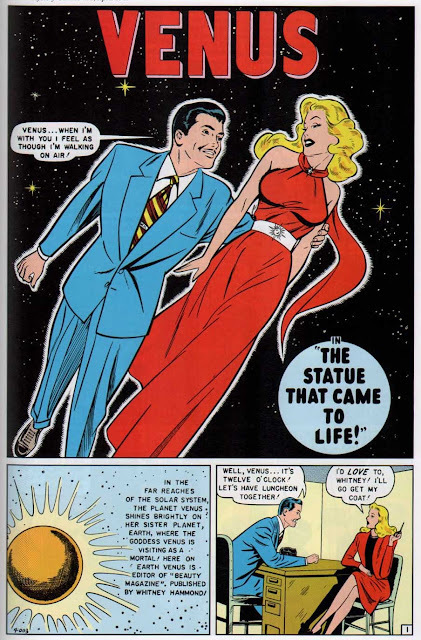 We get away from mythological trappings this issue (except for a quick Jupiter appearance) and the romance influence is the strongest of any Venus story. 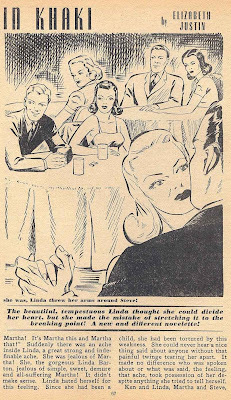 I think I see Werner Roth in this story and the inking reminds me of Morris Weiss’ romance work. If Roth is here, it lays claim to being his earliest work for Timely/Atlas/Marvel. 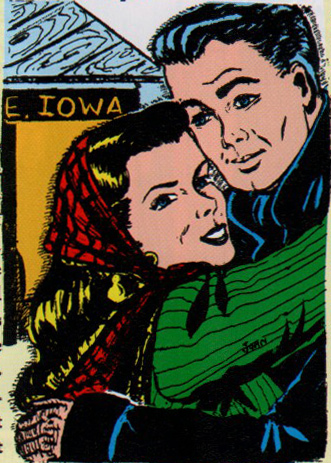 (He certainly is in the next issue, #9). The splash reminds me of Paul Reinman but I believe that may be just a coincidence. Venus embarks on a quest to find the long lost boyfriend of a young woman who writes Beauty Magazine asking for help. 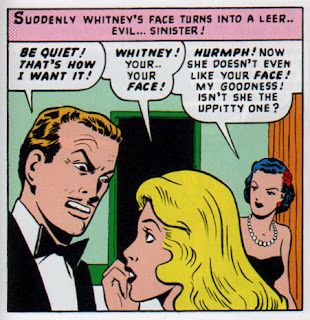 This leads to a convoluted plot where Venus finds the boyfriend, he falls in love with her and then Whitney gets jealous (with Della’s help, naturally). The boyfriend is finally reunited with his now stricken and bedridden ex, but he just doesn't love her, that is not until Venus enters her body, with her charm causing him to fall in love once and for all. The back-up story, “Without Love”, is a 6-page romance story by Bob Powell. Powell’s work was really a shop consisting primarily of Powell, Howard Nostrand, George Seifringer and Marty Epp. From the later 1940’s and into the 1950’s, this shop did an inordinate amount of work around the industry including the bulk of what Street and Smith was publishing in 1948 and 1949, including wonderful work on The Shadow, Red Dragon, Top Secrets, Ghostbreakers and True Sport Picture Stories. In this 1949-50 romance period Powell did 9 romance stories for Timely and added one more romance for Atlas in Love Romances #37 (Mar/54). 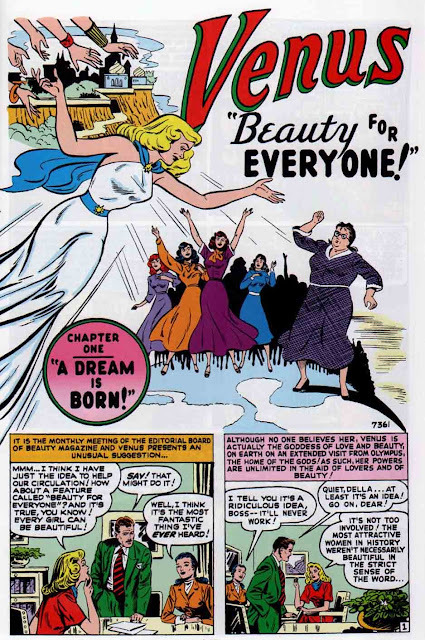 I cannot make out any cover artist on issue #9, a great fantasy scene taken from the climax of the story inside. The woman has the air of Christopher Rule about her, but this is just a feeling. 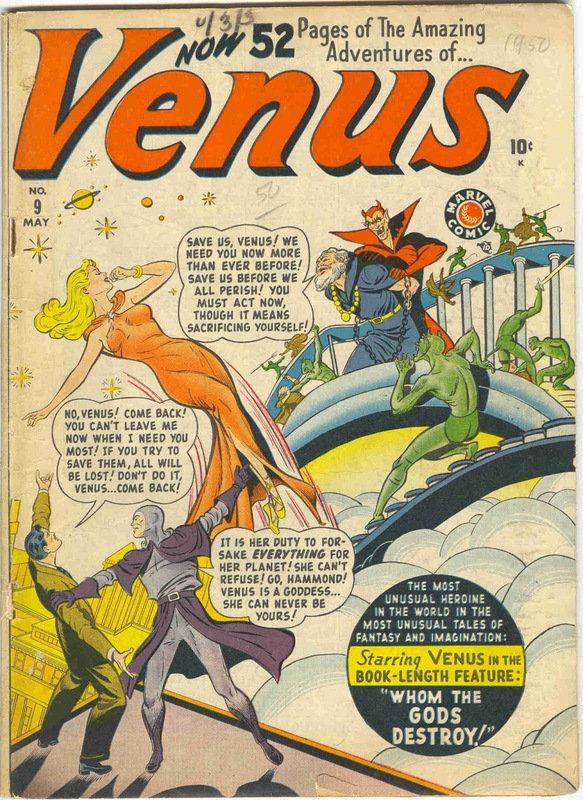 It's actually a great little fantasy cover as Venus is pulled between the despicable machinations of Loki and her earth-bound love interest Whitney Hammond. In issue #9 there is a change in format to a thick 52 pages! 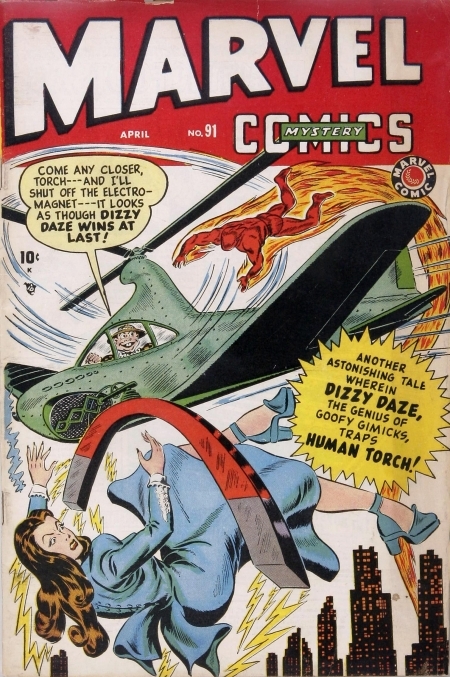 This happened all around Martin Goodman's comic book line starting cover date November 1949 and in some titles lasting as long as cover date November 1952. All told, at least 100+ different Timely/Atlas issues were published in the expanded 52 page format between these years. 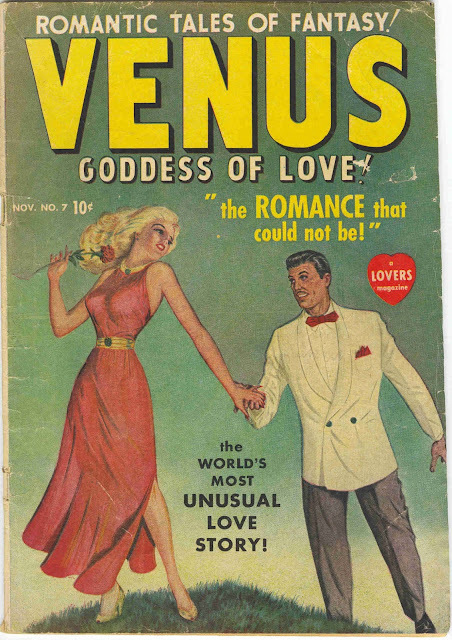 Two Venus stories and two romance tales fill this tome. 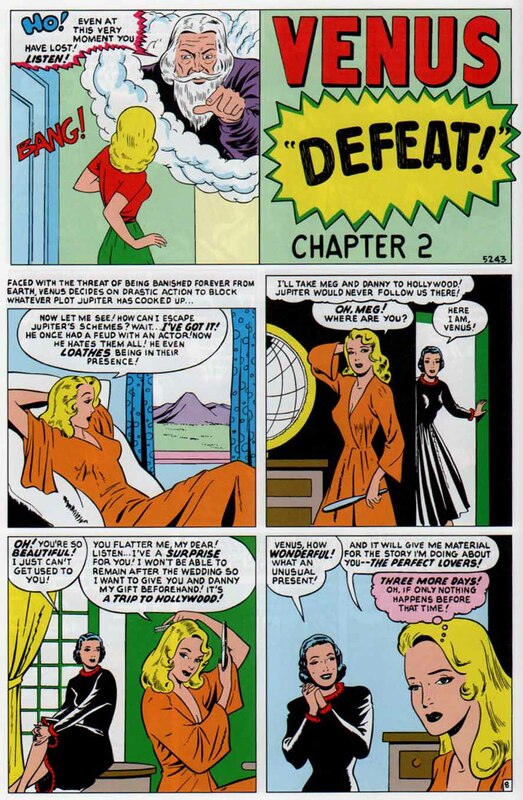 Werner Roth takes the first chapter of this lead 19 page story as Della recaps Venus’ origin from issue #1 and contemplates how she can swindle Whitney Hammond away from her. 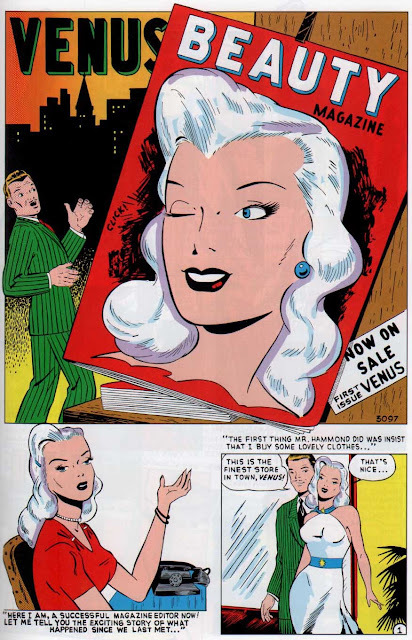 That's Werner Roth's Venus in the splash panel! Whoever was involved with assembling this issue really had problems with story titles! 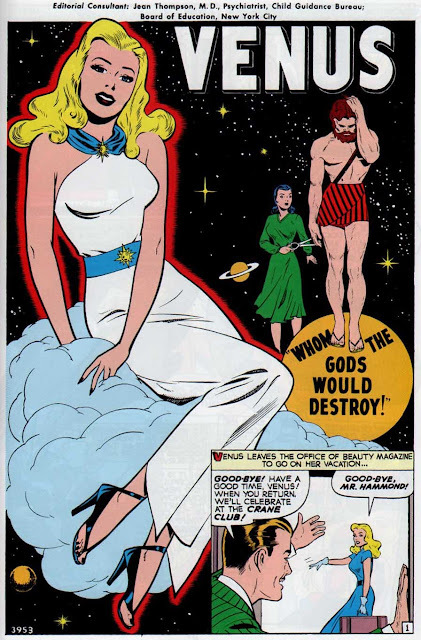 The cover gives this story's title as "Whom the Gods Destroy!" 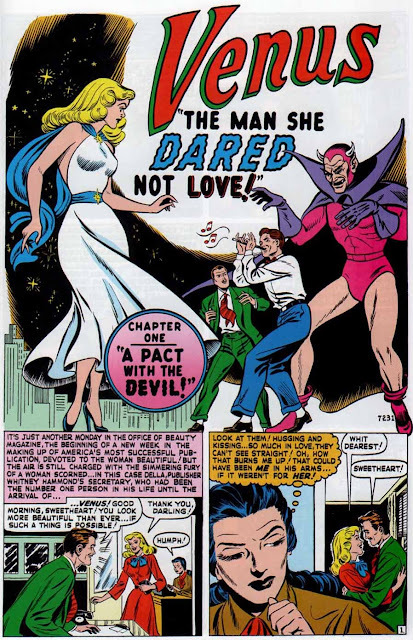 The splash of chapter one gives the title as "The Man She Dared Not Love!" and the actual title of chapter one is "A Pact With The Devil!". So what is going on here??? What is the title of this story??? Meanwhile, Beauty Magazine staff artist Marvin Klee enters and professes his love for Della, trying to serenade her with a god-awful tune from his piccolo. This is an obvious parody of Stan Lee himself, who was well-known to annoy workers at Timely with tunes on his recorder! Back on the “planet” Venus (yes, Mount Olympus is now back on our sister planet), Apollo’s spirit comes to earth with a demon from Loki’s domain switching places with him in Olympus. 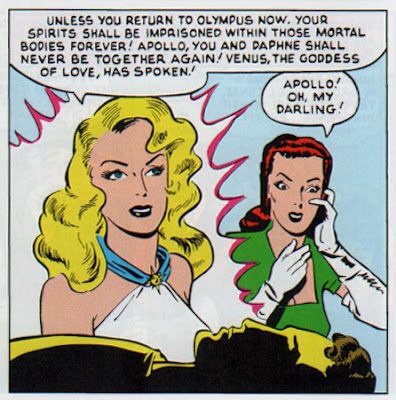 Apollo loves Venus, changes places with the inept Marvin Klee, and goes after Venus with ardent intent. Mike Sekowsky seems to take a partial role in chapter two at the beginning. 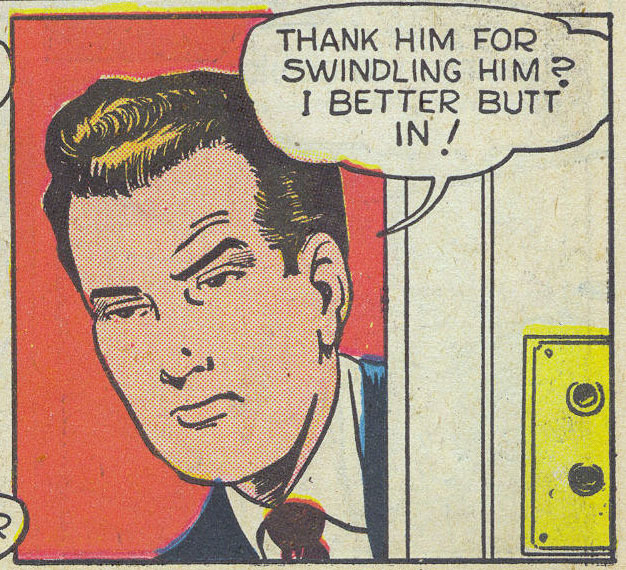 See that man looking at you in panel one? That was penciled by Mike Sekowsky. Werner Roth returns in chapter 3. 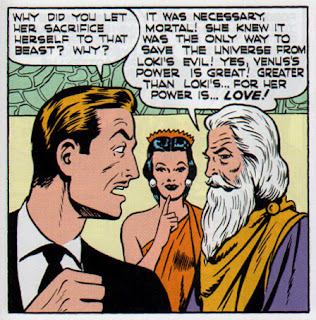 Loki makes another appearance as he plots the downfall of Mount Olympus with the demon co-conspirator in the body of Apollo. 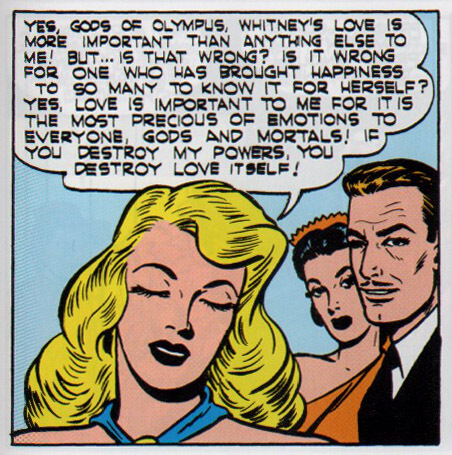 At one point the author forgets who the villain is and actually calls Loki “Lucifer”, but in the end, Venus and love prevail, although Venus has to thwart Whitney’s suicide attempt first! What a convoluted story!!!! A short 3-page romance story is next. The splash looks like a new Mike Sekowsky add-on and the story seems a jumble of stiff, unidentifiable panels and pages (although naggingly familiar from a Timely perspective). The second Venus story is a 10 pager again with Werner Roth as the most discernible artist. 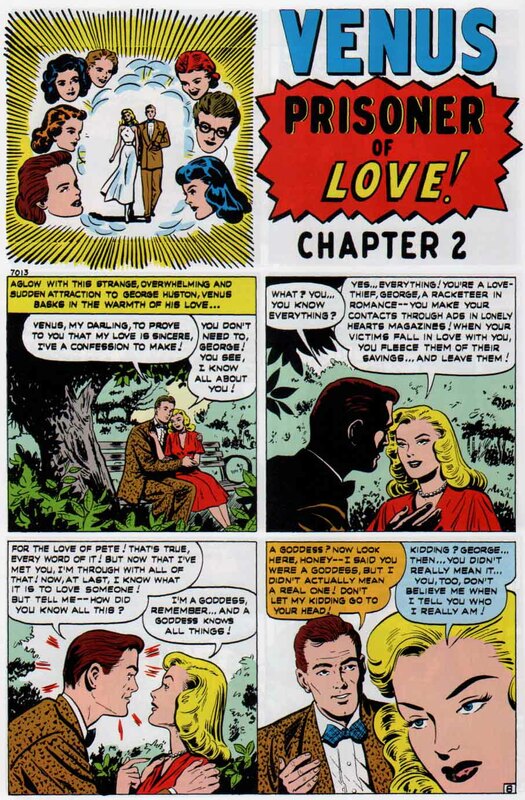 A second romance story of 6 pages ends the book, this time by Maurice Del Bourgo, who can also be found drawing a romance story in Loveland #1 (Nov/49). 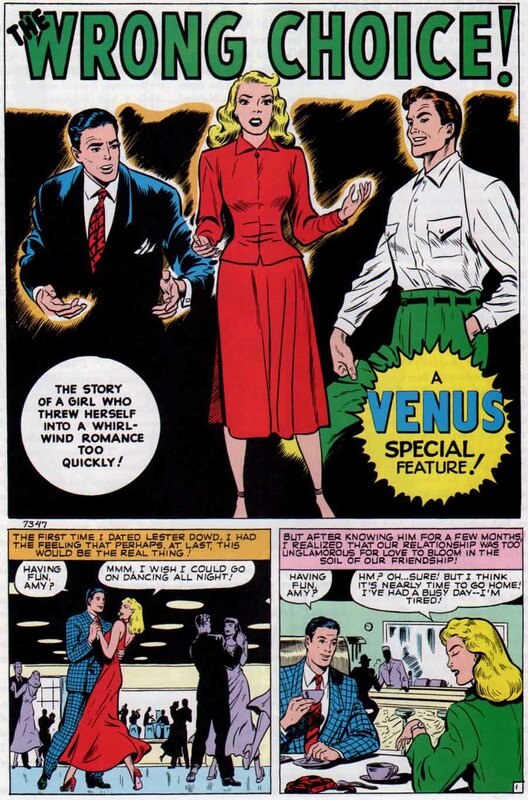 A beautiful full page house ad for Venus appears near the end of this issue. 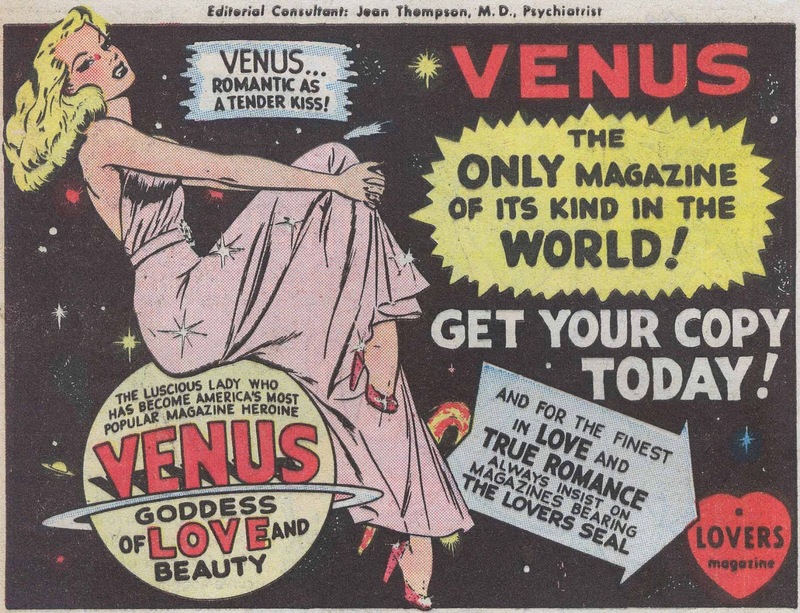 And as will be seen below following this ad, Timely was really pushing Venus internally, as house ads appeared throughout the girl's line of comic/magazines (Miss America & Junior Miss), touting the lovely "Goddess of Love". Venus was definitely targeting the young teen-age girl reader. With the end of issue #9 Venus will change genres next issue as a harder fantasy slant takes over. Needless to say, the very, very best is yet to come! 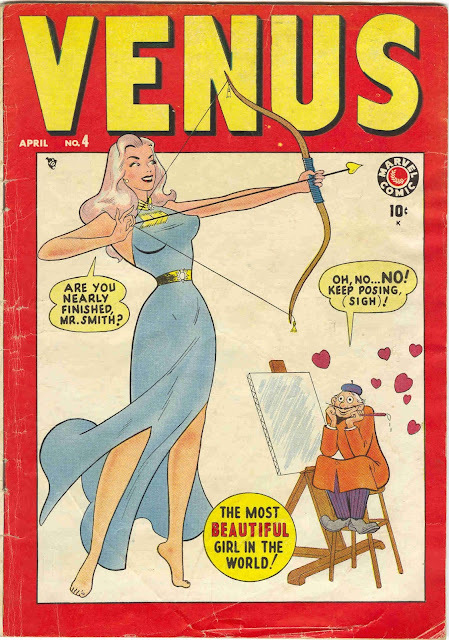 All Venus cover scans, Venus house ads, EC cover scans, Goodman magazine scans, Timely & 'Street and Smith' non-Venus panel, and Ogden Nash's book scans, come from the author's collection. All interior Venus story scans come from the Venus Masterworks volume. No sense further risking damage to my own books! Credits were a compilation of Jim Vadeboncoeur Jr., Hames Ware and myself, with the final voicings done by yours truly.